“Is that the firehouse?” one of my American friends asked? 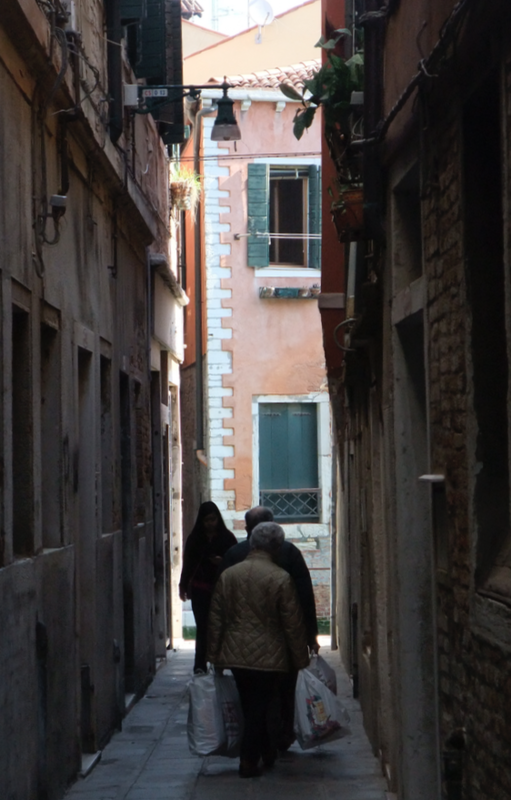 I was taking them on a walking tour of Venice. “It sure is,” I said. I led them onto the adjacent bridge so they could look at the fireboats parked in bays inside the enormous stone palazzo. Vigili del Fuoco on Rio di Ca’ Foscari. “Holy cow,” was my friends’ general reaction. They had forgotten that fire engines would be useless in a city with no streets. 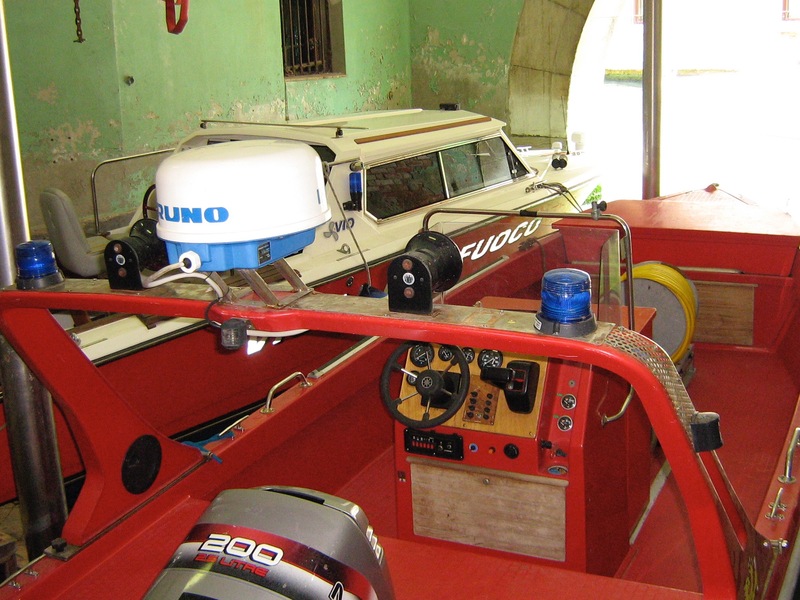 In Venice there were fire boats, a very few to cover almost the entire lagoon. They were firehouse aficionados and collected tee shirts and other souvenirs every time they visited one in the U.S. and abroad. “There’s only one way to find out,” I said. We rang the doorbell and waited. Eventually a man answered the door. 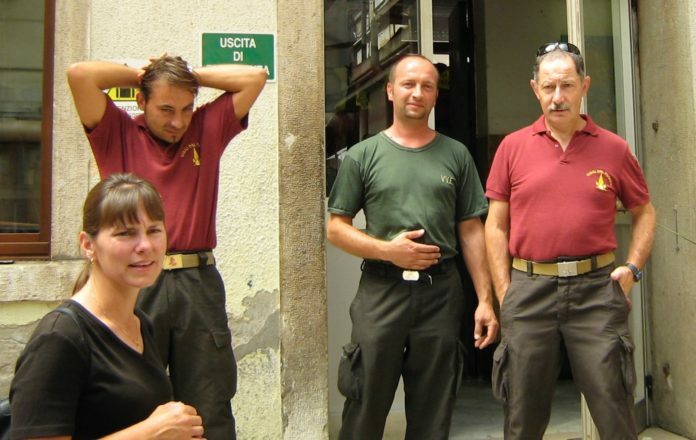 He was wearing a Venetian red polo shirt with Vigili del fuoco embroidered over their logo. Martha leaned into my ear. “We have to get some of those,” she said. In my poor but well-intentioned Italian I asked if we could tour the firehouse. In his poor but well-intentioned English he told me to wait a minute, one of his coworkers spoke English. When the English-speaker saw three youngish, attractive, American women in our group he was all welcoming smiles. And they did. 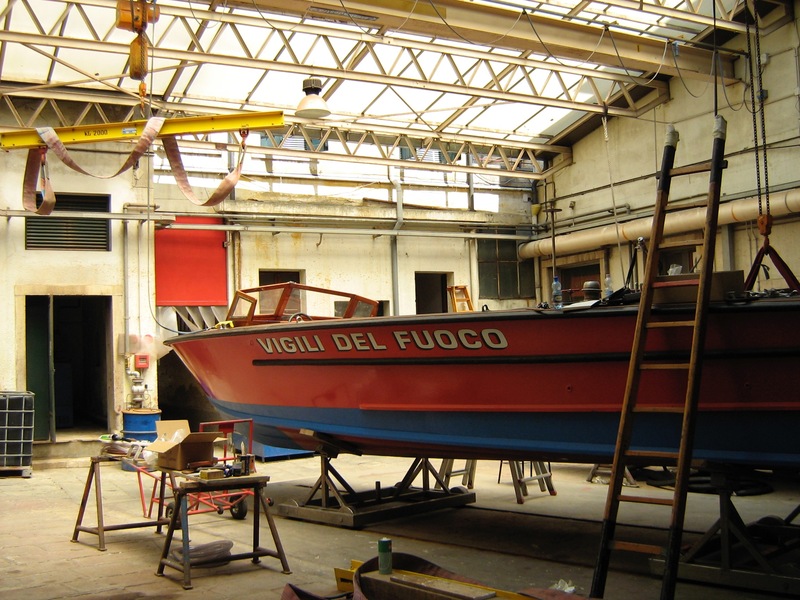 We got up close and personal with the fireboats in their bays as well as the warehouse where they refurbished and repaired boats. They pointed out the Captain’s boat, more elegant than any water taxi, with special pride. They spent a lot of time polishing it. 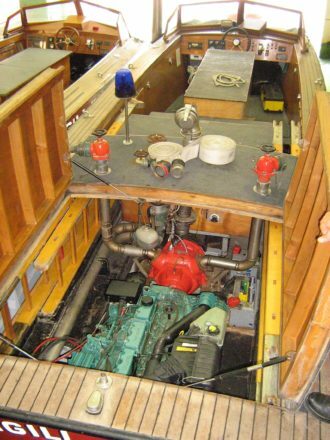 After we had inspected the boats they took us inside for a quick walk-through that eventually led to the spacious, modern kitchen. “Can we offer you prosecco?” our guide asked. “Absolutely,” Martha answered without missing a beat. He looked at everyone else and perceived that not all were enthusiastic about wine at 11am. “We have soda too,” he said, surprised that anyone would turn down a prosecco. He and his cohorts fetched bottles of Prosecco and sodas from the fridge and poured them while the Americans peppered them with questions about putting out fires in a city like Venice. He looked over at his boss, uncertain of something I couldn’t decode. His boss nodded. 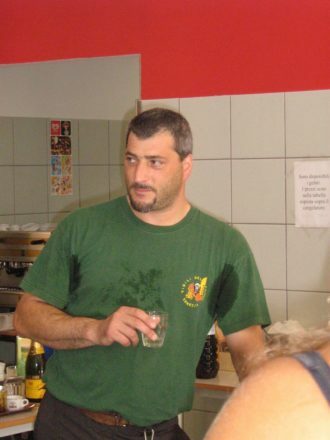 “Quanto?” the younger fireman asked sotto voce. They obviously had never been asked to sell them and decided on twenty euros a piece as a fair price. 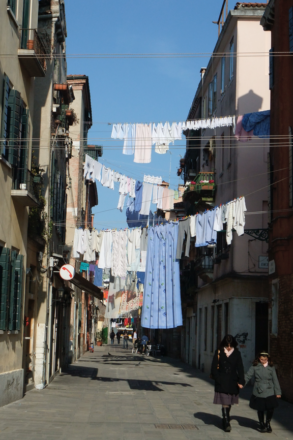 The Americans bought six and wore them proudly as we headed out toward our original goal, the bridge across the Giudecca Canal constructed on the backs of boats once a year for the Festa della Redentore. If you arrive in Venice by train, this is what you see first as you walk out of the station. 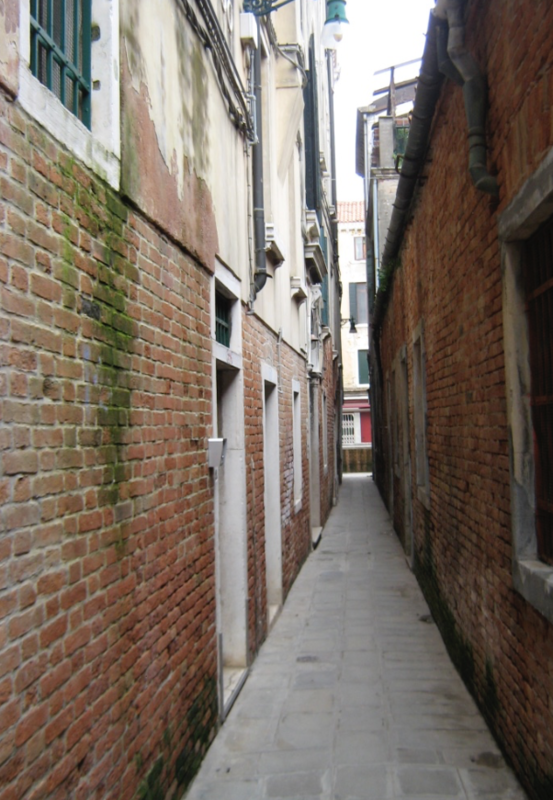 Because there are no streets as we understand them, Venetians have different words for different types of pedestrian passages. These narrow streets are called calle. 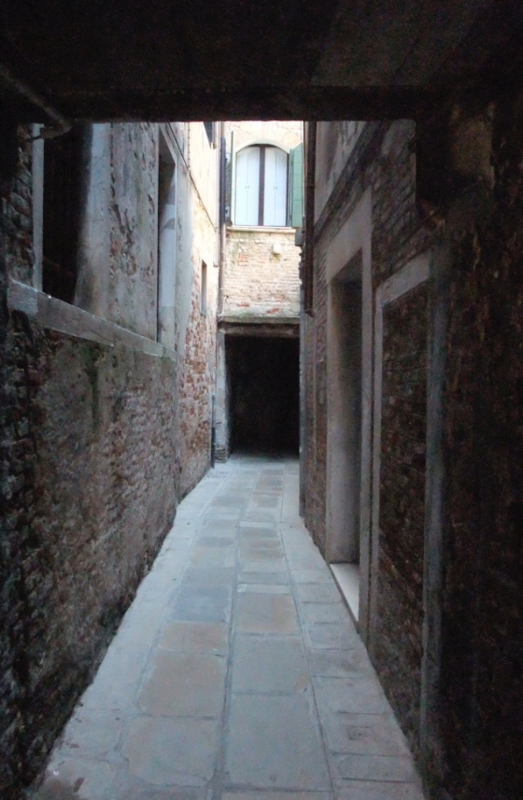 This calle is wider, has shops on both sides, and leads into a campo, or square. Streets that were originally paved (as opposed to mud paths) were called salizada. A street that runs along a canal is a fondamenta. 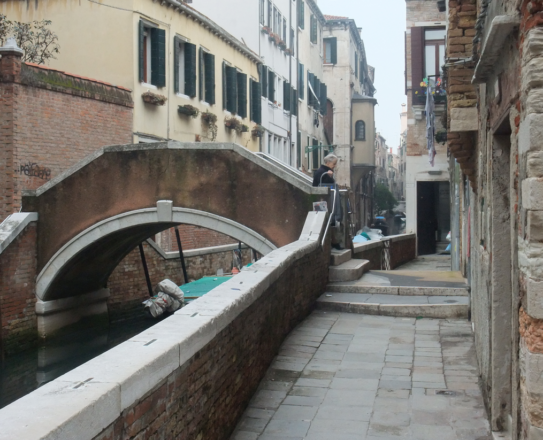 Here’s a canal, a fondamenta, and a calle. 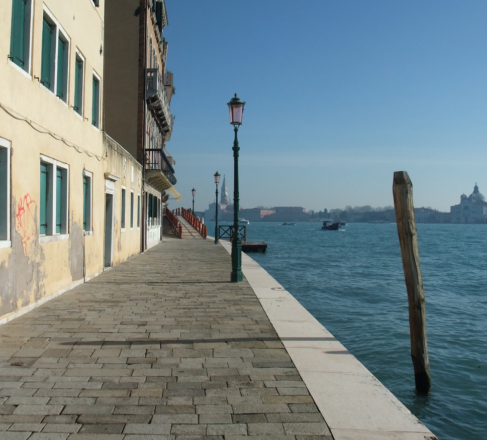 The Zattere is a long boulevard-y fondamenta along the Giudecca Canal, the channel separating Venice proper from the adjacent island of Giudecca. 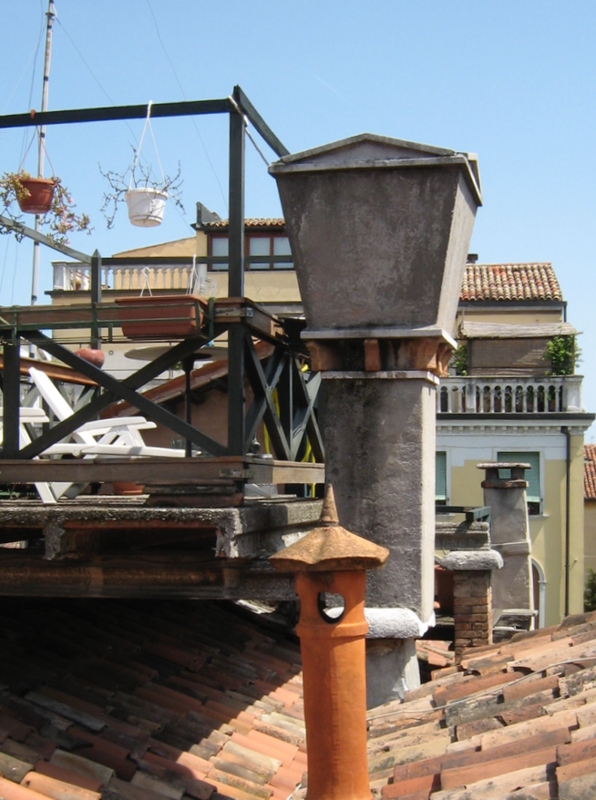 Altanas, which are not unique to Venice, are wooden decks built on rooftops. The altana on the left is smallish. 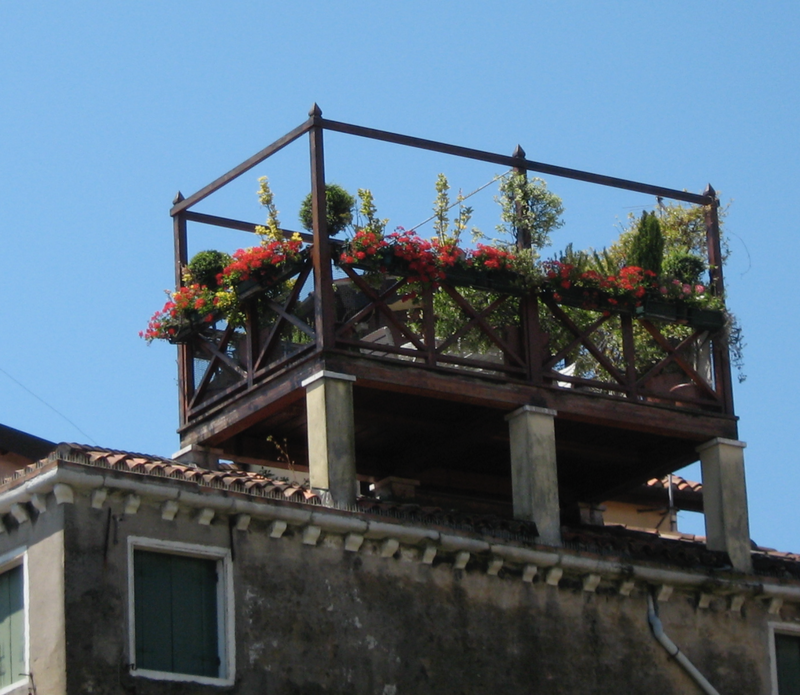 The one on the right is adjacent to the roof terrace of the building I lived in near the Accademia. 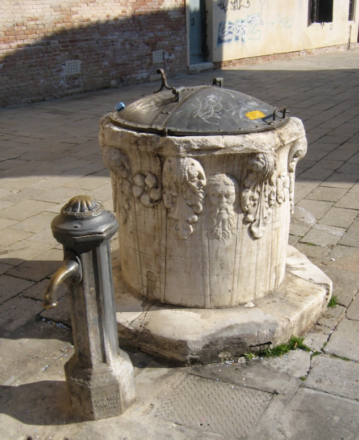 A pozzo is a well. 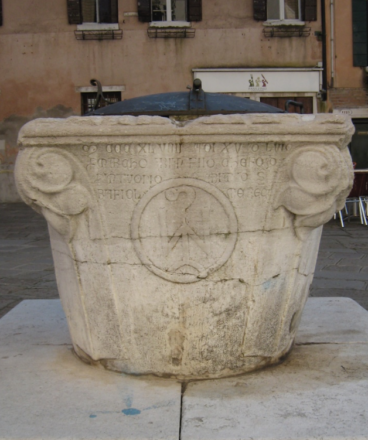 Since Venice had no access to fresh water until an aqueduct was built in 1886, they depended on capturing rain in these clever pozzi built over cisterns with sand filtration systems. 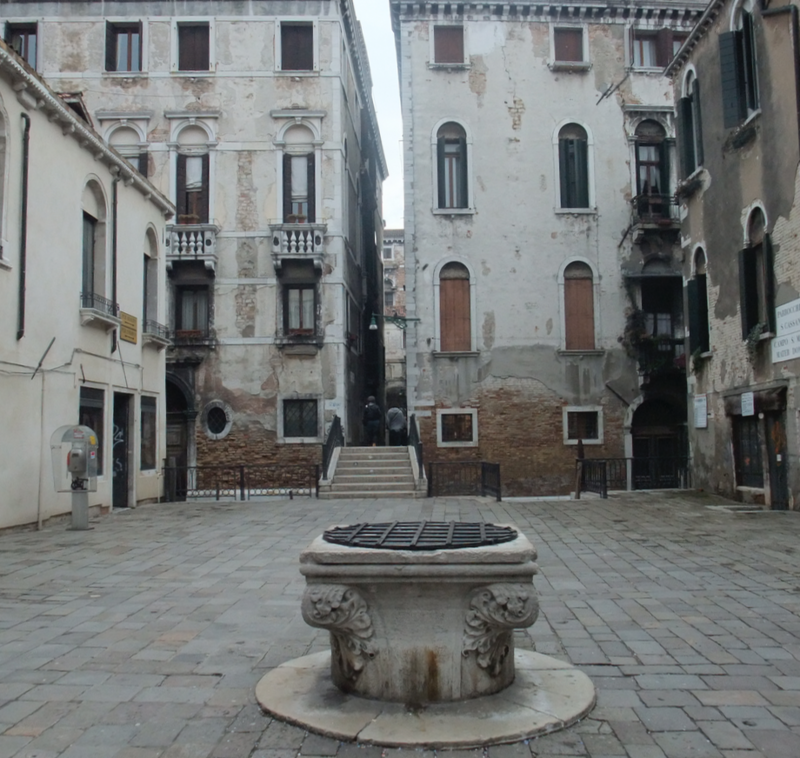 Every campo, or square, had a pozzo, as did the courtyards and gardens of people who could afford them. When water was finally piped into the city, the pozzi were sealed. In order to qualify as a campo, a square needed both a church and a pozzo; if it had only a pozzo, it was considered a campiello — a little square. 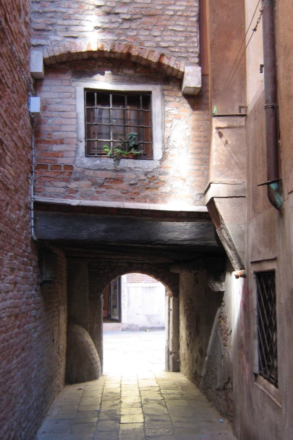 A sottoportego is a passageway where a street runs though the ground floor of a building. Here is a sottoportego leading to a campiello with a pozzo. 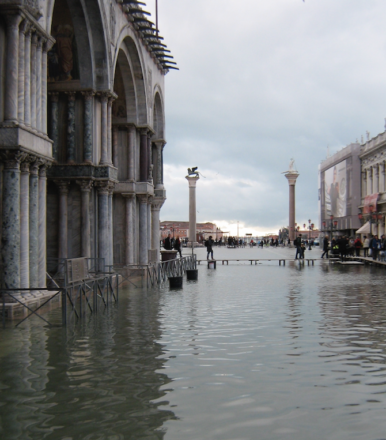 Acqua alta, which literally means “high water”, refers to the recurring extremely high tides that flood much of the city. 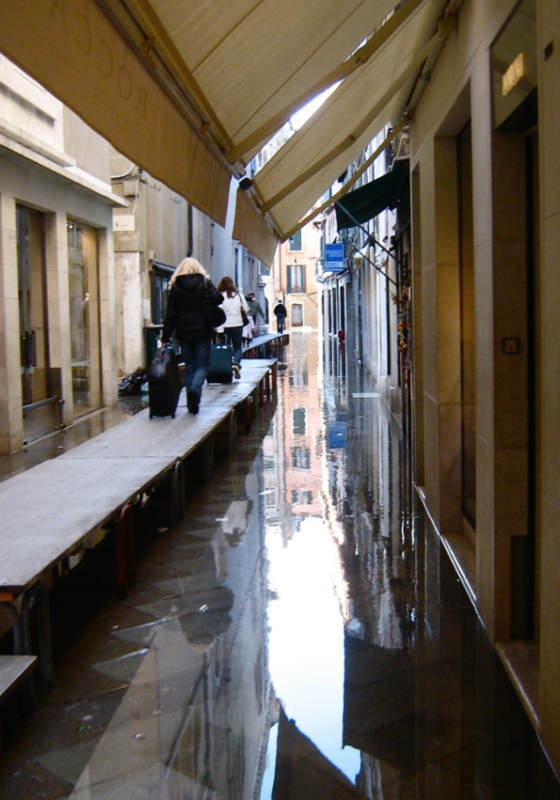 Wooden walkways above the sidewalks, called passarelle, are put out in advance (hopefully) of the acqua alta. 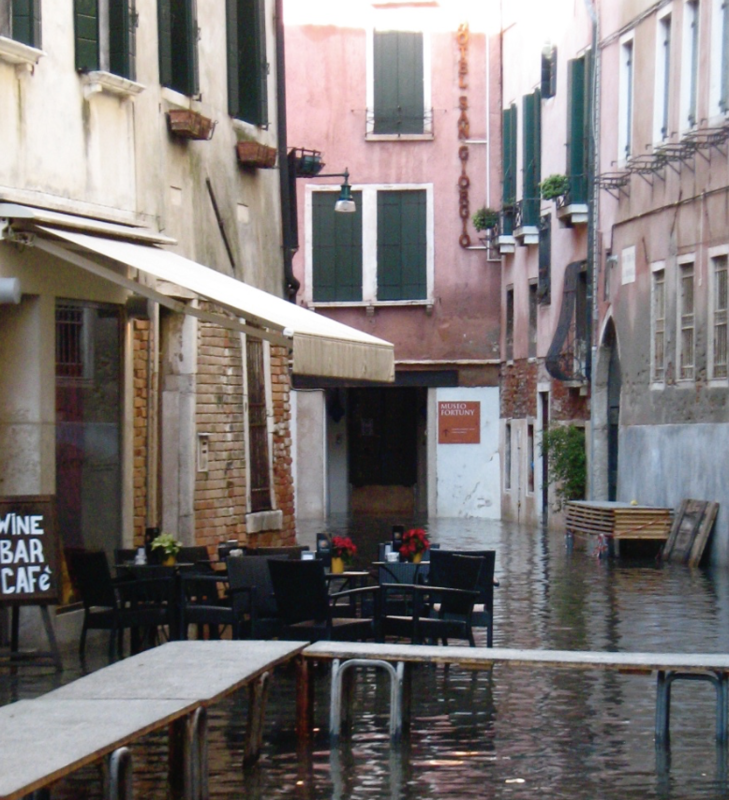 Acqua alta doesn’t stop anyone from grabbing a coffee at their favorite bar. 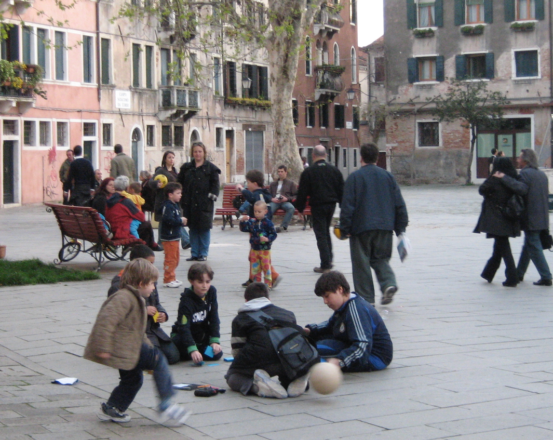 The campi are the centers of neighborhood life. This is Campo San Giacomo del’Orio where I shopped and grabbed coffee and sat and watched the Tuesday night tango dancing for three years until I moved near the Accademia. Venice is divided into six districts or sestieri: San Marco, Castello, Canagreggio, Dorsoduro, San Polo, and Santa Croce. 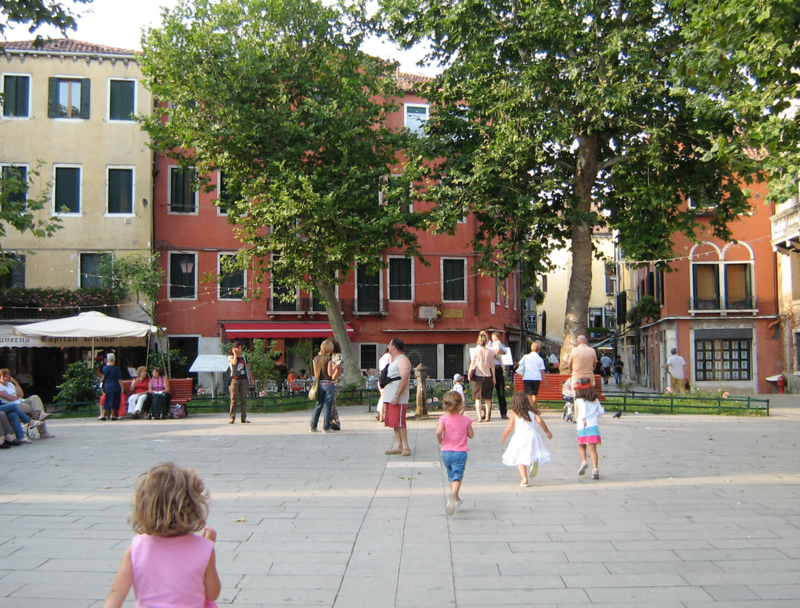 Campo San Giacomo is in Santa Croce. The library of the San Giorgio Maggiore complex, dating to the renaissance, had a nice filing system: an author’s works were shelved under his statue. You had to know what Plato or Plautus looked like. And a couple miscellaneous items I couldn’t resist. A renaissance keystone on an arch over a water door along a canal. You always have to look up as well as down when walking in Venice; you never know what you might see. 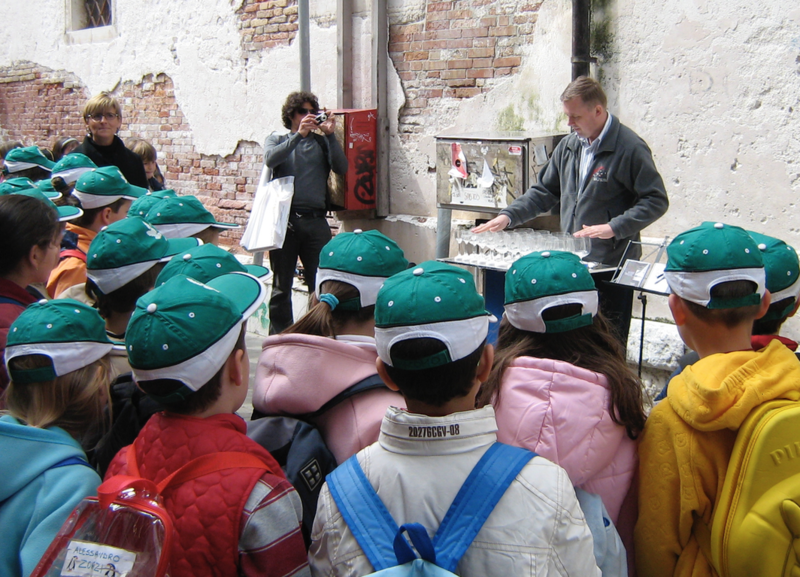 A group of school children stop to listen to this gentleman play “The Dance of the Sugar Plum Fairy” on crystal glasses filled to different levels with water to produce different tones. This particular spot was not far from my garden gate, and with my windows open I often heard him playing. He’s pretty good although the repertoire is limited. Giotto di Bondone, 1305, at the Scrovegni Chapel in Padova. 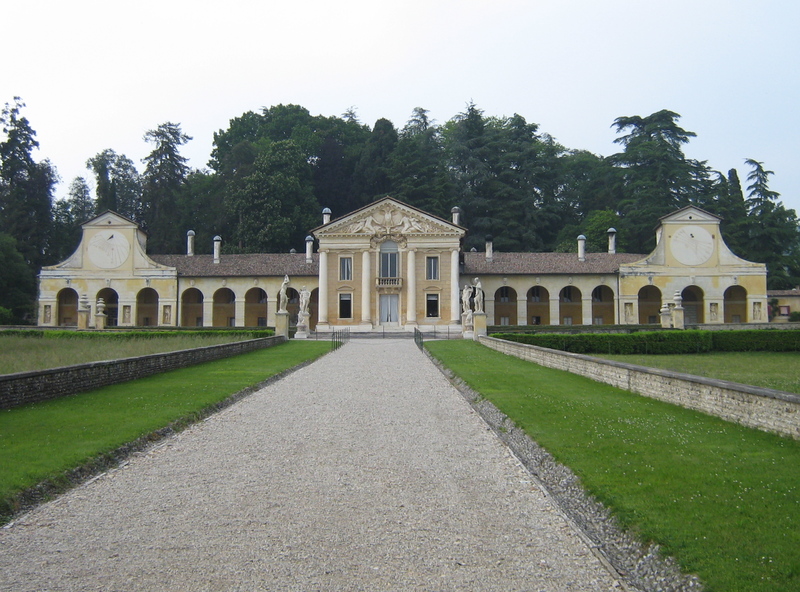 2008 was the 500th anniversary of Andrea Palladio’s birth. A brilliant traveling exhibition was mounted in Italy which I was fortunate to catch in Vicenza, which, far more than Venice, is Palladioland. I subsequently wrote the following essay and filed it away in a folder inside another folder. Hey, it’s only ten years late. I am pleased to report I still stand by every word. Right off, the show set me up for a vision of harmonious, balanced, and symmetrical spaces designed to elevate the human spirit. Goethe said that architecture is frozen music; Palladio listened to the Pythagorean music of the spheres. 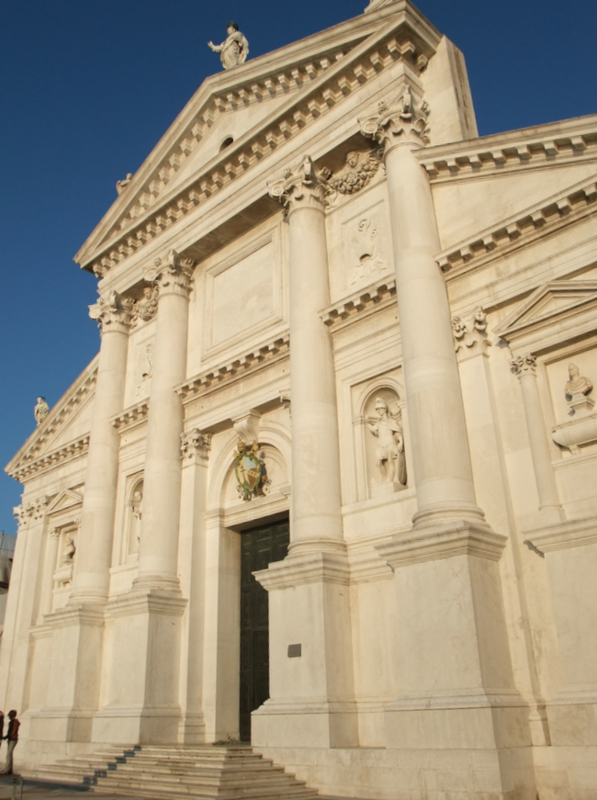 While designing and building villas (before Palladio architects were only advanced stonemasons or sculptors) for the movers and shakers of renaissance Vicenza and Venice, Palladio pursued a vision. The individual buildings were a means to his end. He created for the world at large and he built to last, but he also learned the glory of imperial Rome from its ruins which had also been built to last. They were his textbook and his greatest inspiration. 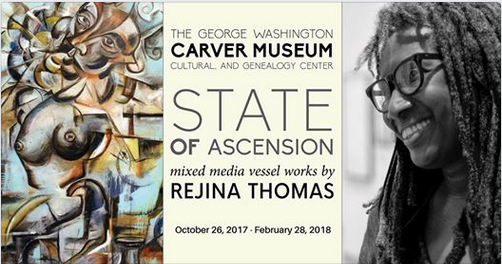 He was not a local boy building big houses; he was an evangelist for an elevated vision of domestic and public spaces. The buildings were arguments that Vitruvius had been on to something. 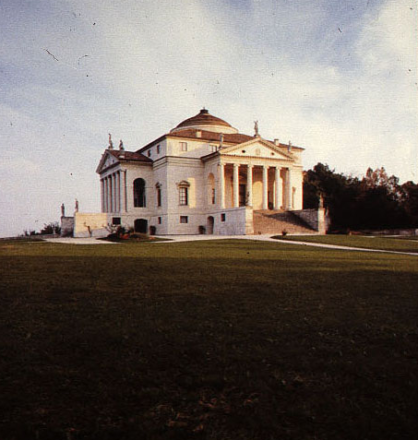 Palladio’s most brilliant buildings are not slavish imitations of Roman imperial grandeur, they are variations on Roman themes, blending Vitruvius’s ratios and the intricate stonework of Corinthian capitals with the modern world as he knew it. It was fascinating to watch this vision emerge fully formed, like Minverva. His signature is emblazoned on the portico at Villa Tressino at Cricoli, a renaissance vision crystalized between the square towers of a stodgy medieval building. His style developed to better realize his vision. His understanding grew, deepened, and expanded as idea and theories were tested in reality and perfected in practice. He knew the Roman’s ratios but not their trade secrets. That took experience. In the meantime he grew increasingly more daring and original in the drawings, where imagination reigned; he sketched and erased and redrew his way to an expanded understanding of the possibilities of Roman architecture. And not only the exteriors. 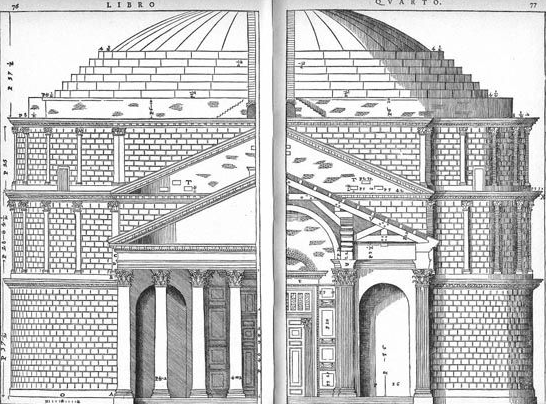 Detailed renderings of interior floorplans are based on the ratios of Vitruvius and Alberti, Palladio’s muses, along with the ruins themselves which he measured with a tape measure, all those vaults, arches, columns, capitals, and domes, especially and uniquely, domes. There may have been a dome or two before the Romans, but they perfected domes and the techniques for building them with lightweight concrete. They integrated the dome into the profile of important buildings and of the city itself. 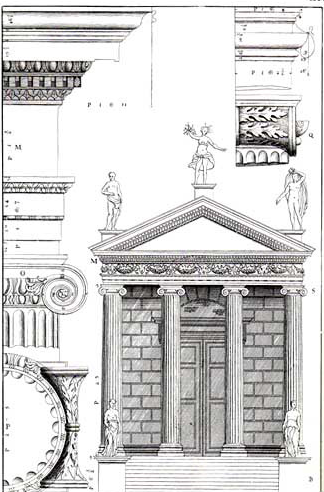 Elevation and section through Pantheon’s portico. The size and shape of individual rooms are in fixed ratios, stairways are golden spirals, the number and placement of the rooms are Fibonacci sequences. In the early plans for one of the villas Palladio quickly sketched sixteen variations, shuffling them like tiles in an orthographic Rubik’s cube. Most of the models are sectioned and spread to show the inner workings. 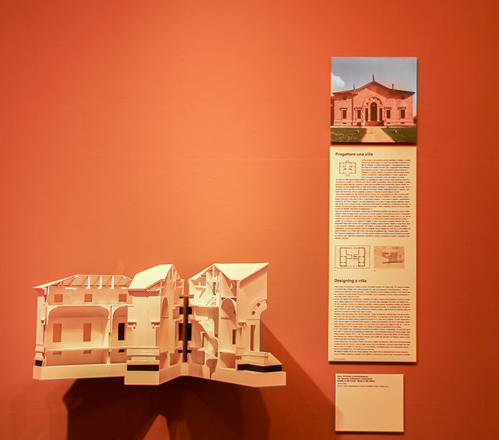 Watching the transformation from related sketches to building plans to models of the buildings spotlighted Palladio’s infinitely detailed creative process. He sculpted on a very grand scale. Nothing was left to chance. He sketched the finest details of pediments and cornices, rustication patterns, the interlacing of brickwork. My favorite drawings split a building down the middle and present, on right and left, two possible variations with subtle changes creating varying impacts. The woodcuts for his Four Books of Architecture, executed from his drawings, are as precise and detailed as Durer. Sometimes he is drawing the plans for a villa, often he is recreating ruins, reimagining them intact from whole cloth, possibly better. 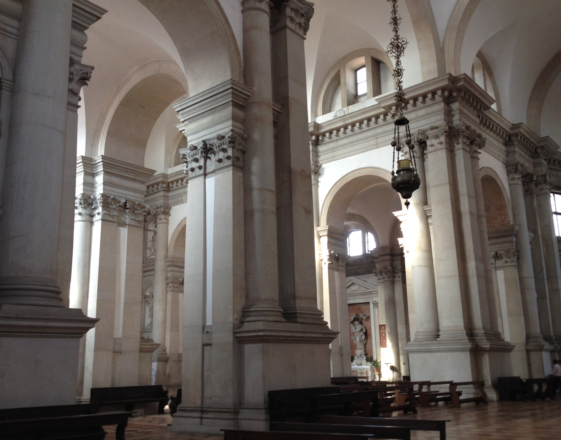 One must view them as Palladio’s and not antiquities. Often, the drawings of the villas he built don’t reflect the existing structures. That is because they are the director’s cut, representing what he really wanted to do, and would have done if he had been freed from the constraints of egos and budgets. 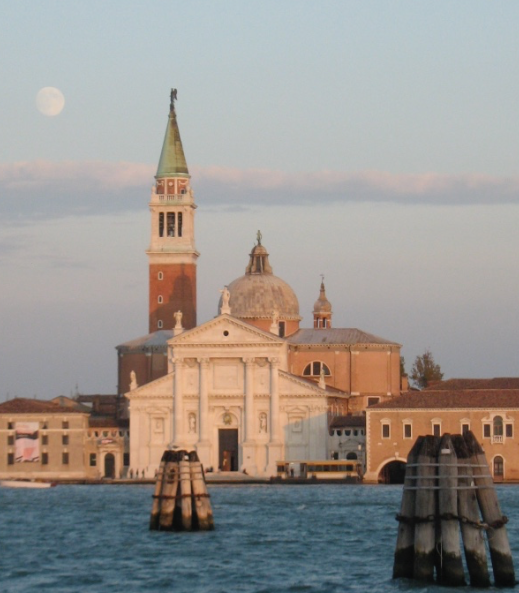 I was most amazed to learn that the iconic facade of San Giorgio Maggiore in Venice was not what Palladio really wanted. 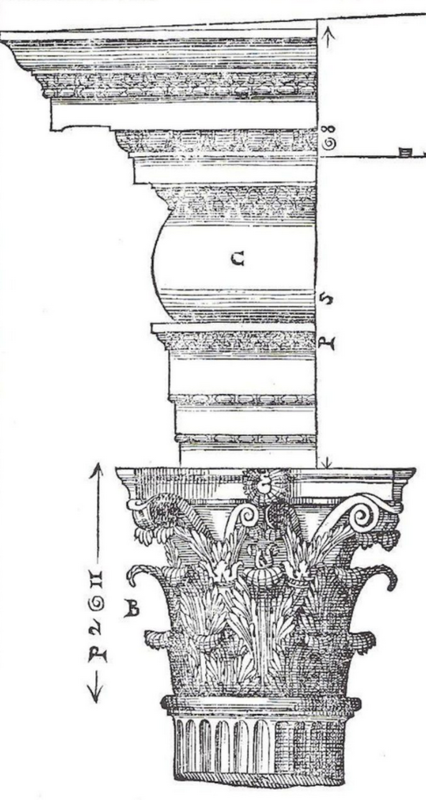 The pediments flattened into two dimensions — a bas relief of a Roman temple — were a late compromise. Superimposed pediments were a stylistic innovation Palladio pioneered to resolve the conflict between the Roman temple’s monospace and the Christian nave-and-aisle form. He first used this solution at San Francesco della Vigna and San Pietro di Castello, and perfected with Il Redentore. 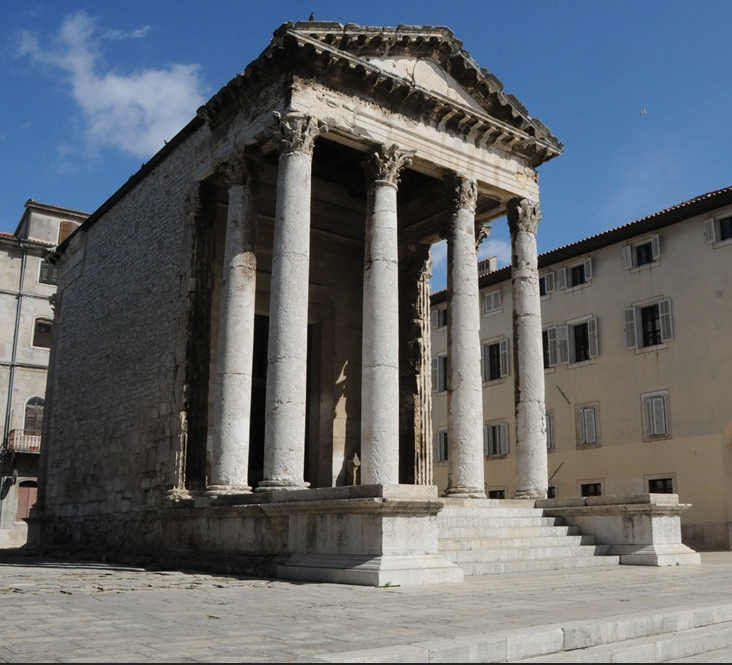 Temple of Augustus, Pula, Croatia. The model of Palladio’s ideal San Giorgio prominently features a pronaus, a porch with freestanding pillars extending 40 more feet toward the water. Reprieved from flatness, it thrusts majestically toward St. Mark’s basin. The design is based on the Temple of Augustus in Pula, Croatia, which Palladio drew and redrew, analysed to the last micrometer, ran through the liquid-state computer of his brain, and then fought to build in the “real” world. But the Benedictine monks who initially authorized his design later got cold feet. It was too Roman, they said. Too Pagan. They asked him to collapse the porch and superimpose the pediments as he had done so many times before. 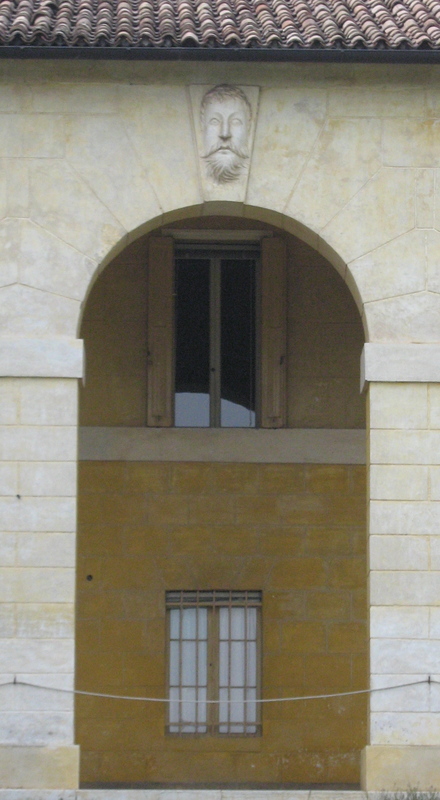 The existing façade is a facile but flat solution. Or beyond, I would add. 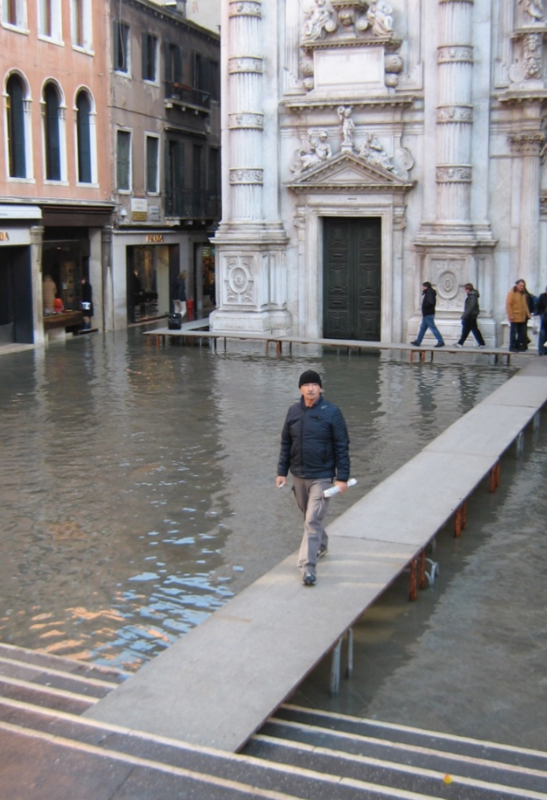 My favorite exhibit in the show was a computer animation of Palladio’s proposed Rialto Bridge. A series of preliminary sketches and refinements, along with the final elevations and a large model, precede the main event. 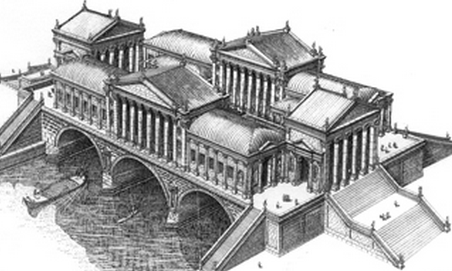 The computer animation takes the viewer on a stroll through the Roman forum posing as a bridge. It is huge for the site and far too complex for a pedestrian bridge. Nor does it face Grand Canal and offer sweeping vistas. It faces inward, and views the Grand Canal through precisely placed porticos. 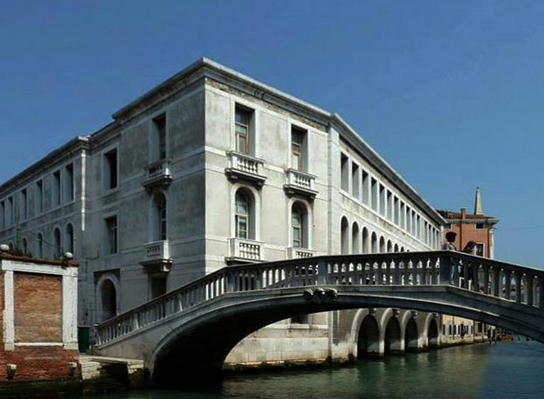 Palladio’s bridge would have changed Venice at the expense of everything Ruskin held dear. I walked away from Palladio’s bridge proposal and from his proposed redesign of the Doge’s Palace, relieved that they only exist on paper. Had Palladio gotten his way, the signature Byzantine gothic, so flamboyantly unique, raised to a pitch of perfection in the lighter-than-air pink Doge’s Palace, would have vanished. 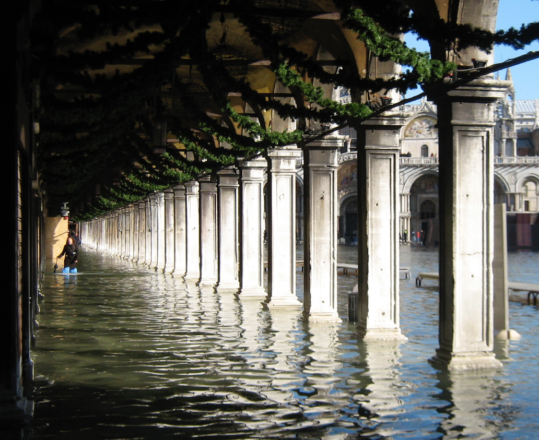 Ruskin’s “central building of the world” would have gone the way of old Rome. 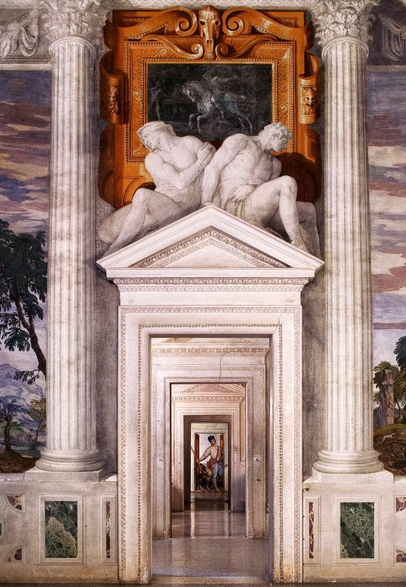 I walked away convinced that Palladio’s singular brilliance shines most brightly in his villas, where he had the blankest possible slate and the fewest constraints to realizing his total vision. Like Frank Lloyd Wright, his private homes featured his most consistently brilliant and innovative work. 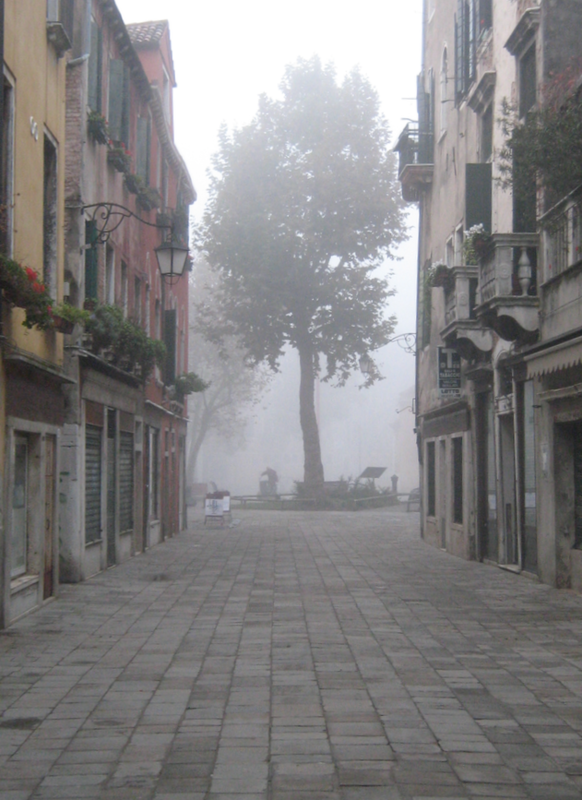 He had no other mold to fit than the gently rolling hills and fields of the Veneto. Palladio’s best villas are glimpses of perfection, unfettered by surrounding buildings and pre-existing structures, built from the ground up and from the sky down. His great churches may be recycled Roman baths, but his villas are private heavens. Villa Barbaro, with Tempietto at the right. Ideals exist only in men’s minds. They are, in dictionary-speak, the concept of something in its absolute perfection. They are ideas. Villa Barbaro is one man’s idea of perfection. The man is Andrea Palladio. The idea is the unity of form and function to create an ideal building that is as lovely as it is useful, perfectly suited to its purpose and beautiful to the eye, whose exterior appearance and proportions express its internal symmetry and harmony. 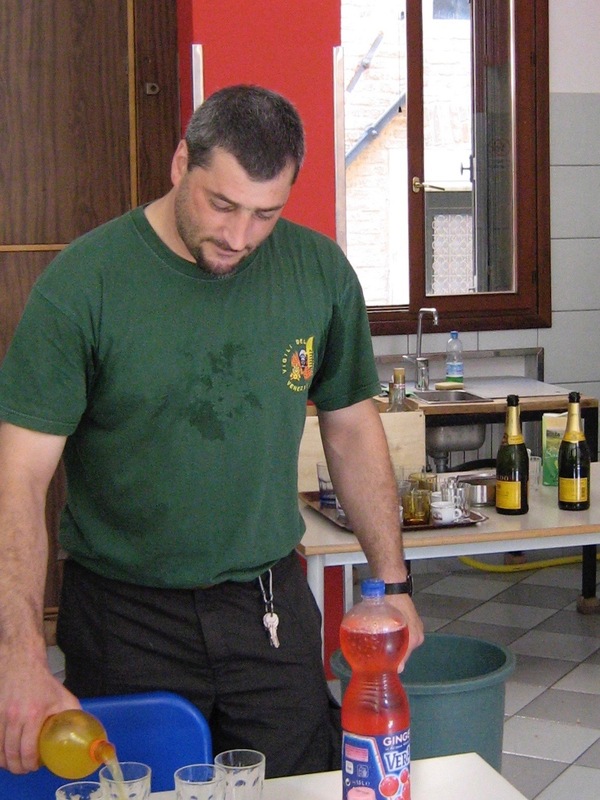 It is located in the village of Maser, 6km from Asolo in the rolling hills of the “prosecco” region of Italy’s Veneto. 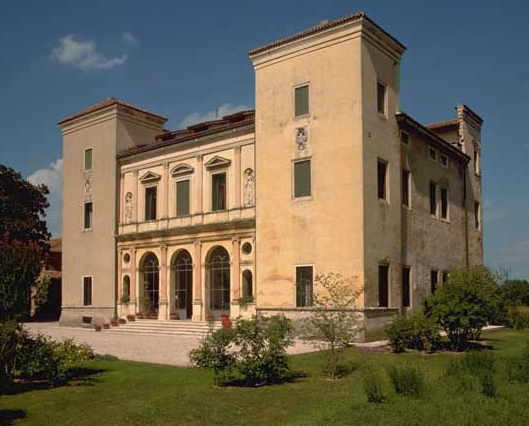 In 1557, the Barbaro brothers, Daniele, Patriarch of Aquileia, and Marc’Antonio, a leading Venetian statesman, commissioned Palladio to build a villa on the site of an old family farm. Both brothers were architectural experts. 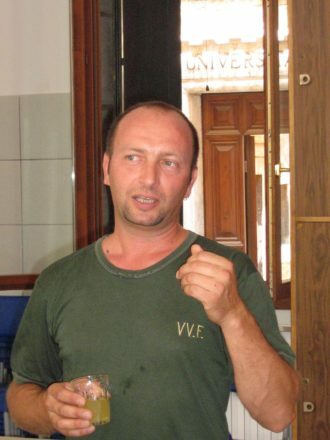 Daniele, Palladio’s patron, had translated and annotated Roman architect Vitruvius’ epochal work “De Architectura.” Marc’Antonio prominently figured in the discussions of all major building projects in Venice. The Barbaro brothers not only wished to transform an old farm into a modern country estate. They also wanted a suitable expression of their own taste and refinement, of their vast wealth and exalted status, of their profound erudition and lofty ideals. Daniele travelled with Palladio to Rome where they studied not only the great buildings of classical antiquity, but the newest and most sumptuous palaces and villas, including Rafaello’s Villa Giulia. If Villa Capra “La Rotunda,” outside Vicenza, perhaps Palladio’s most perfect villa, is the ideal of villa as sylvan pleasure palace, stately and resplendent upon its hilltop outside Vicenza, Villa Barbaro, built into the rolling hillsides of Maser, is the ideal aristocratic country retreat as working farm, a unique fusion of industry and luxury. When I set out for Maser from Venice, the day was bright and sunny; the sky was cloudless, the kind of blue in which Bellini might have robed a fragile but regal Madonna. Driving north and west through the suburban sprawl of Mestre and Treviso, the warm, moist sea air met the cool winds blowing down from the Alps. The sky grew heavy, veiled with a humid grey curtain of clouds behind which the sun played hide-and-seek. Maser is a very old and tiny village whose ancient contours remain visible amid the new apartment blocks and shops. 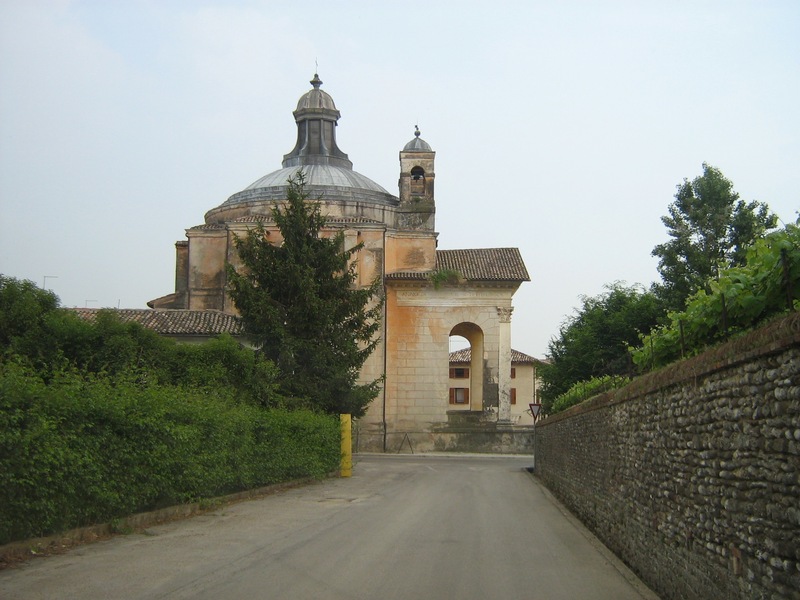 Just beyond Maser, before reaching Villa Barbaro, you see first, in the distance down the narrow road, the Tempietto, the little church that Palladio built later, downhill from the villa. 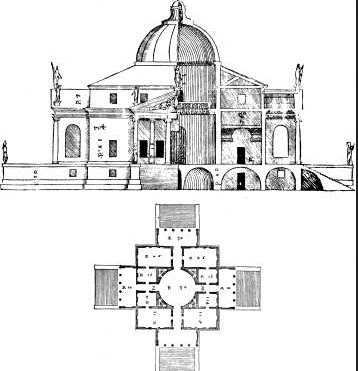 Here Palladio was able — as he was not allowed in his major Venetian commissions — to build a church on a round “central” plan, reminiscent of Rome’s Pantheon but more closely akin to Palladio’s own reconstructions of the Temple of Romulus on Rome’s Via Appia. 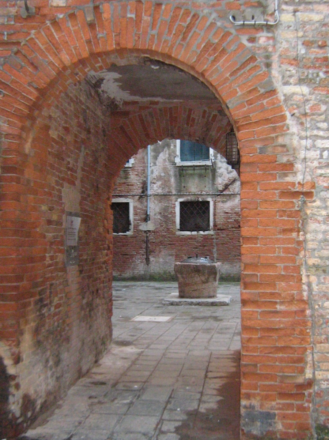 Unfortunately, the Tempietto is no longer open to visitors. The front of the villa — lawns spreading before, lush green trees rising behind — is stunning, startling at first. 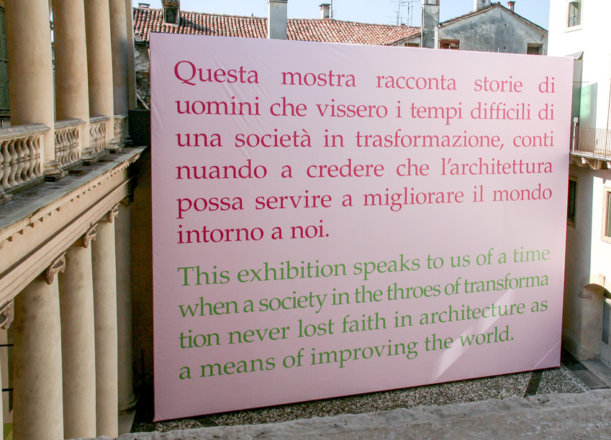 It is Palladio’s “five-part profile”. Look closely; it is the same line, the same arrangment of masses, the same rhythmic configuration as in countless Palladio-inspired buildings including the U.S. Capitol in Washington. D.C. 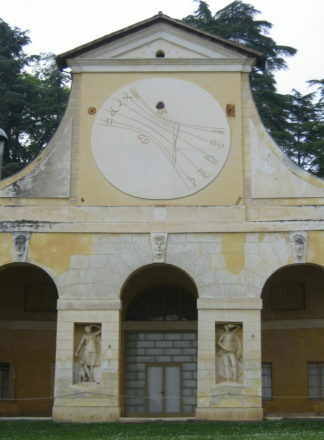 The two extreme outer wings, the barchese, were the barns and storage areas of the farm; above the corn-threshing and wine-making areas on the ground floor, they are topped with graceful astrological sundials on their second floors behind which were the dovecotes where domestic fowl were raised. The barchese are linked to the central living quarters of the villa by arched porticos; this gives the building its long line, the dramatic and ceremonial facade facing the road below. The living quarters project out from the barchese and porticos; its temple-inspired design, four tall columns supporting the sculpted pediment, centers, with both mass and weight, the horizontal line of the villa. The sundials, the frieze of the pediment and its supporting columns, the details of the symmetrically flanking porticos and rounded arches of the barchesse are white; the rest is yellow, setting-off the villa, jewel-like, on the green hillsides. Driving to the parking lot behind the villa, you realize this was indeed a farm; a farm like no other, but a farm nonetheless, flanked by barns, stables, grape arbors, and below, both near and in the distance, orchards and fields. 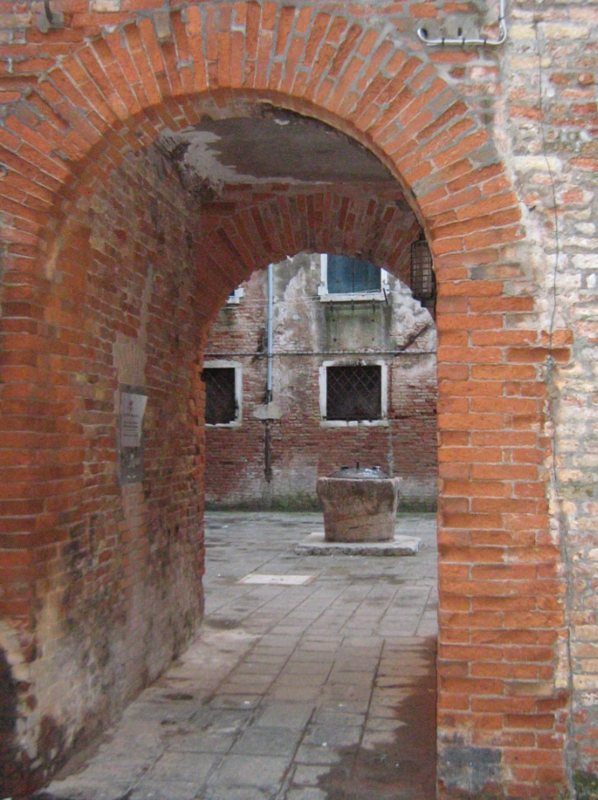 You enter the villa through the ground floor portico. 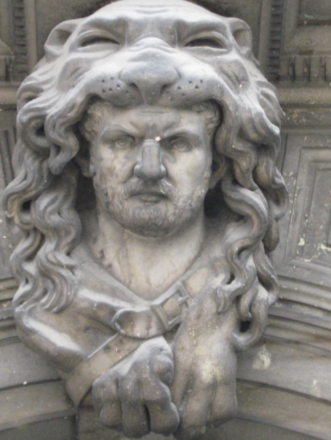 The keystones of the arches are carved with faces; each has a distinct personality. There are statues in each of the niches between the arches. Broad stone stairs lead up to the second floor entrance to the villa. In the homes Frank Lloyd Wright designed, he often created low and narrow entry passages that suddenly opened onto broad luminous spaces: the “wow” factor. He felt that entering a building should have that sort of impact. He had nothing on Palladio. From the shady interior of the portico, up the dark, cool stairway, you step into a cruciform hall topped with high and airy white vaults. As suddenly luminous and spacious — as beautiful — as it is, that’s not the wow! The wow! 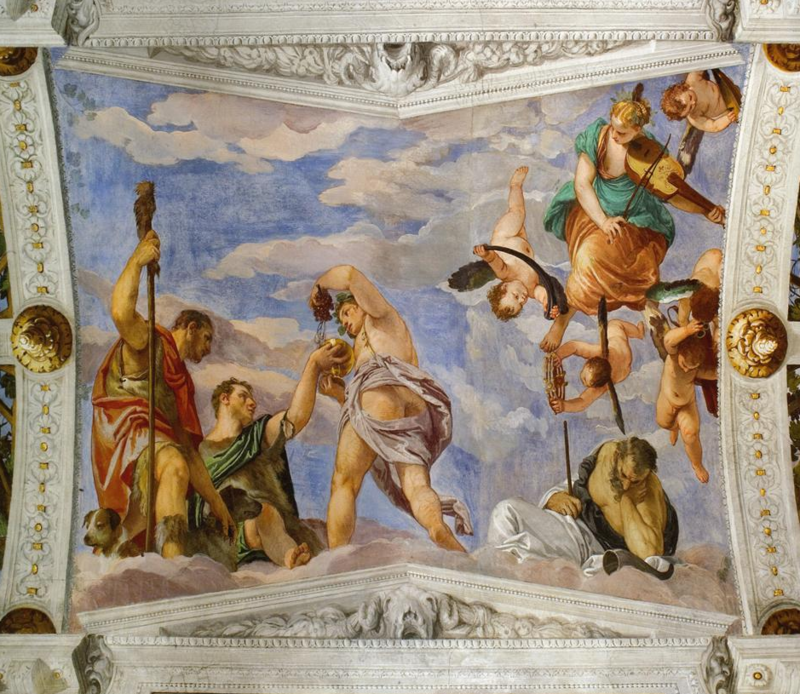 comes from the walls themselves, covered, both in the cruciform hall and in all the rooms we are allowed to visit, with vivid frescoes by Venetian mannerist Paolo Veronese. That there may have also been frescoes on the white vaults of the cruciform entrance hall is a matter of dispute; but there certainly are in each of the other rooms. 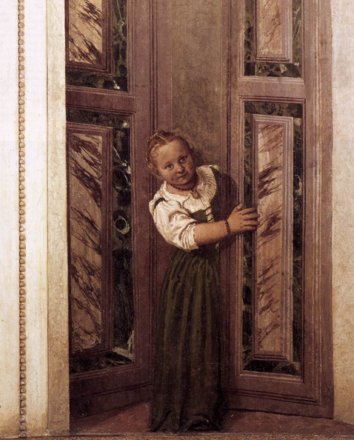 On walls and on ceilings, you are surrounded by classical allegories alternating with sly trompe l’oeil; scenes of gods and goddesses, rich and suggestive, alternate with open doorways that appear real; from behind one peeks a little girl so vivid she seems to breathe. Here, in Wonderland, frescoed landscapes frame windows through which real horses graze in real landscapes. Doors, windows, views — classical fantasies, romantic antique ruins, towering fig trees and grape arbors, balustrades and pilasters — all painted, appear real; amid them, gods and goddesses, saints and allegorical figures, share space with the family members peering down over a balustrade, triumphantly lifelike, flanked by servants, children, pets. Look carefully. The interplay of fantasy and reality is as bright and quicksilver as the sun in the clouds. These spaces are filled with a literally wondrous, alternately sublime and whimsical evocation of the spontaneity and joyousness of family life. And there is nothing approximate or arbitrary about these spaces. The proportions of width to length to height are exact mathematical ratios; both in the volumes and in the planar surfaces, the arrangement of rooms to halls, of windows to doors, everything is proportioned to produce a sensation of aptness and well-being, the perfect fusion of comfort and luxury. At the center of the horizontal axis of rooms that extend symmetrically along the back of the villa is the Sala L’Olimpio. 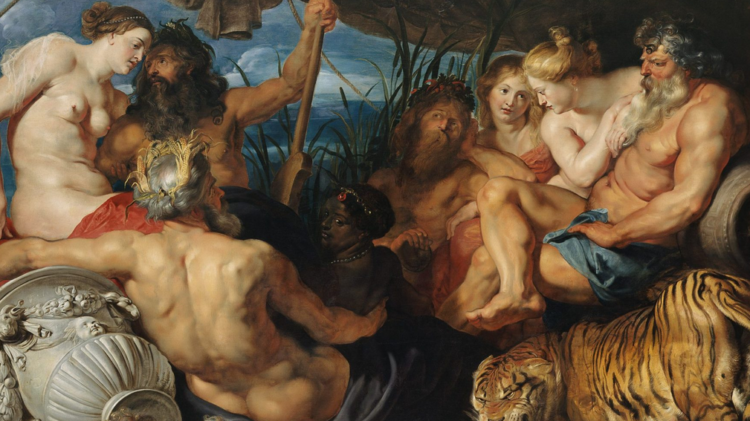 In the ceiling vaults and the lunettes, the Olympians are arrayed — Vulcan, Neptune and Juno, Fertility, Fortune, and Love — fire, water, air, and all the tutelary deities of family life. Yet just there, right above you, looking over a balcony, in a sumptuous blue dress, is Giustina Barbaro Giustinian, the wife of Marc’antonio Barbaro, with a nurse and her three sons. Their little dog sits on the balustrade; there, by the spiralling pillar, their parrot peers down quizzically. In the Sala del Cane, the Room of the Little Dog, Fortune deals Envy and Ambition their just desserts in the vault above. 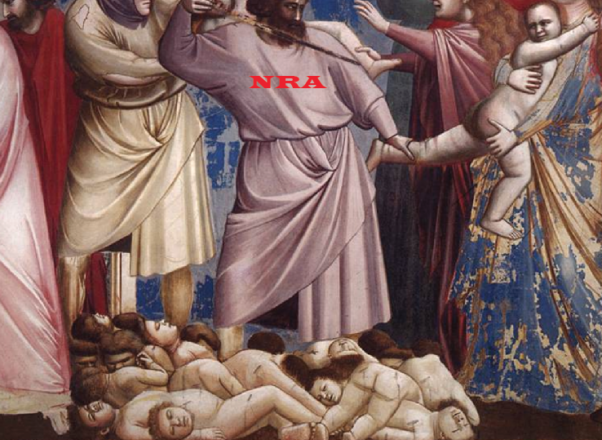 Moral order triumphs. 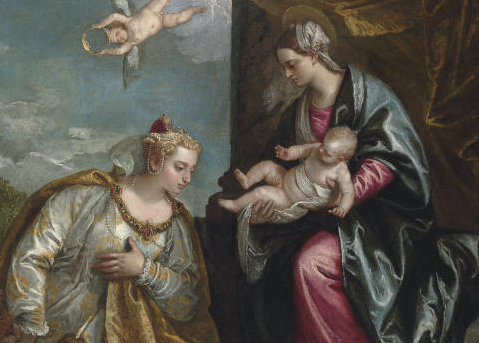 In the lunette, St. Catherine hands a dove to the Christ child. Religious piety prevails. But lower, beneath, at floor level, against the faux marble detailing of the wall, a small dog watches observantly. Real? No. More than real; fixed, in the way that art does, in the utter and timeless immediacy of his moment, the family pet is captured in his essence for for all time. I walk back through the cruciform hall toward the front of the villa, to the Stanza del Tribunale D’Amore, the room of the Tribunal of Love. Amid swirls of chubby and angelic Cupids, the Bride, her Husband, and their Judge stand ankle-deep in snowy clouds. Around them, to their left and right, arbors of vines and leafy trees spiral outward through latticed openings in the ceiling. Across the room, in a marvel of illusionistic trompe l’oeil, upon a faux ledge, are the painter’s slippers and a brush, left absent-mindedly behind. The room comes to life. It breathes. 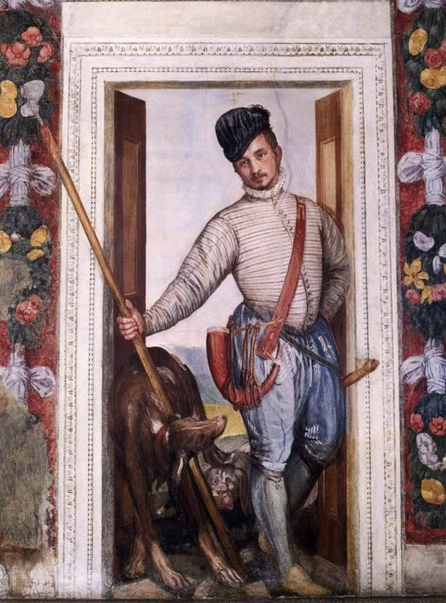 There are only a few other visitors as I step across the corridor to the Sala di Bacco, the Room of Bacchus. Between the landscapes frescoed on the walls, vines laden with grapes climb up, creeping as if behind the cornices through the ceiling toward the sky. My back is turned toward the rear of the room. I hear quiet voices. A woman reads from the plastic card handed out to everyone as they enter. As she continues, both reading from the card and describing the room in detail, I turn. A man stands between two women. The first thing I notice is that he is not wearing the oversized scuffs each visitor is given, which fit over your shoes, to protect the polished terrazzo floors. The next thing I notice is that he is blind. “What color is it?” the blind man asks. “Trompe l’oeil,” the blind man whispers. The blind man asks a stream of questions which the women answer patiently, fully, embroidering their answers with as much detail as possible. There is friendship between them, long years of deep knowing, and abundant love. Brother? Husband? Friend? He hears, but does not see, and one can’t know exactly what he experiences. Does he sense the harmony of the space, feel in its volumes and the beautiful interior symmetry? I hesitate to ask; I only know that, stroke by stroke, the room takes shape in his mind, the blank corners filled in by questions and answers. I should say: an image of the room takes shape in his mind, an idea of this perfect space, this ideal room in the villa in Palladio’s mind. It is an idea to which Palladio was able to give physical reality, breathing life into the ratios and proportions. It is a miracle of painted illusions surrounding actual windows that let in the light and the landscapes of the surrounding countryside as integral parts of the design, the marriage of the inside and outside, of reality and illusion. Ideals exist only in men’s minds. Occasionally, in the hands of exceptional artists, they are given a physical reality, so sensuous and powerful that it infuses the consciousness, beyond the immediate sensory input it provides, forming in the mind a whole greater than the sum of its parts. At Villa Barbaro, the real and the imagined, the physical and the ideal, merge momentarily in Palladio’s enchanting conception. Outside, I walk the paths, exploring the exterior of the villa — the niches and statues, the echoing arches topped with somber and pensive and smiling faces, the vivid roses splayed across the peach stucco outbuildings, the vast lawns where horses, as sleek and elegant as Veronese’s, nibble the grass. I can’t get the blind man out of my mind. Returning to the car I pass them again, seated on a bench overlooking the countryside spread like a Persian carpet in front of the villa. 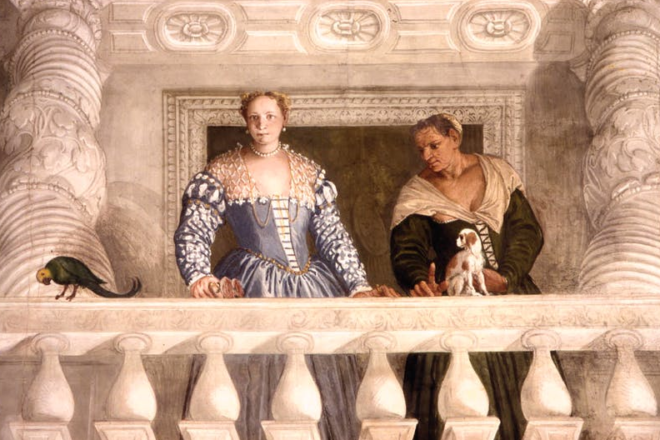 Patiently, in detail, the women describe the scene before their eyes, the glimpse of the dome of the Tempietto between the weathered stucco outbuildings, the horses, the distant campanile near the horizon. He smells the roses and the fresh green grass; he feels the sun breaking through the clouds on his face, and hears the sounds of the place, the cadences of mass and space, the music of air and stone. The stucco is darkened in the shade with mildew; the frescoes have been eroded by time, covered over, scraped clean, restored in the intervening centuries; the surrounding countryside has been encroached upon by modern suburban life. But the ideal still exists, pristine in its perfection, taking form in the mind of a blind man. 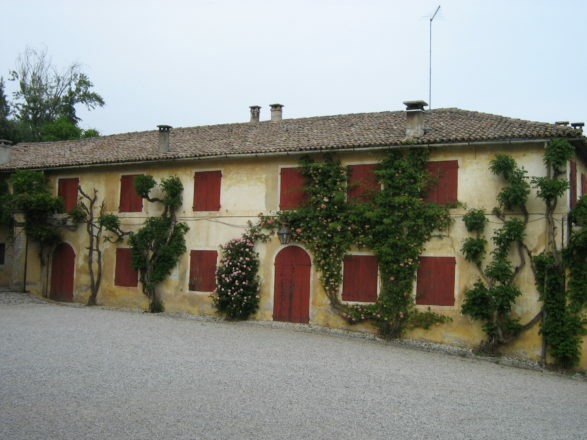 Villa Barbaro, in Maser, is, perhaps, as close to ideal as we get. 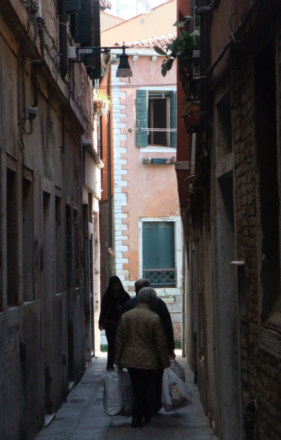 Yesterday I took a walking tour around Venice with Jan, her son Chris and daughter Katie, and her brother Glen. Despite the grey sky, through which a glimpse of sun only occasionally broke through, and an intermittent spatter of rain, we hit some high notes, as it is almost impossible not to do, took a few breaths away, dropped a few tears of dazzlement and wonder, and covered a ridiculous amount of territory, the fault for which is mine, being, as ever, overly ambitious. Every walk around Venice is different although all of them are basicially the same. You have, first of all, a group of people with various interests, whose buttons are pushed by different things — for good or ill — and who bring their own unique sensibility to the recognition and appreciation of the unique landscape that Venice offers. 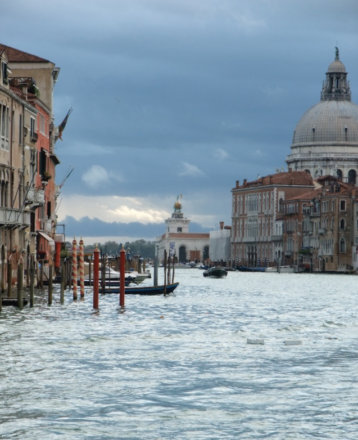 A simple ride on the vaporetto presents a dazzling array of responses. The questions come from all directions and are wide-ranging and unpredictable. And although I have become more familiar with the responses of adults, this time it was the children who provided the most challenging and fascinating glimpses. Jan is a friend of Denise, Denise is a friend of my niece, Laura; they are old friends, childhood friends. Jan is an elementary school teacher who taught all of Denise’s children; her husband’s work brought him to the Veneto. This was not Jan’s first trip, nor will it be her last. You can tell. She’s gotten the bug, that strange and delirious infection with the unique music of the Venetian mise-en-scene. It was, however, the first time for her brother Glen, and for Chris and Katie. Walking, the questions come from all sides, in volleys, and can be about anything, really, and everything, from “who is buried in that tomb” to “where do you eat lunch” to “why are you here” and “what are you doing here?” These last are, actually, the most difficult to answer. Either I know who’s buried in the tomb or I don’t; but why I am here and what I’m doing here are questions with no easy answers, they are moving targets, and most certainly fall under the rubric of “work in progress,” the answers at best approximate and variously dependent on the weather — emotional and physical — and one’s state of affairs. There is nothing stable or established in my being here; like all improvisations, the next movement, even the next phrases, are often unknown, barely visible. 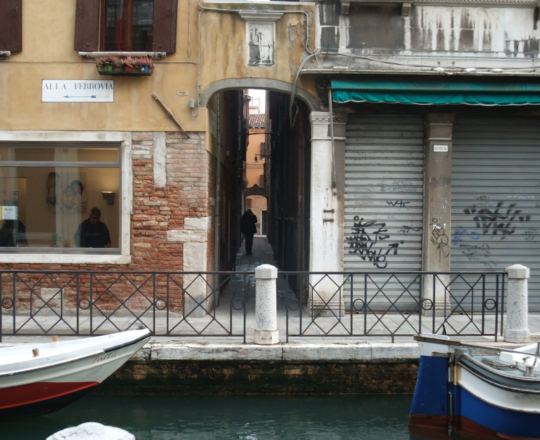 It was hard for me to stop feeling like a tourist and confront Venice as place where I had to figure out how to live. Giving these tours lets me straddle the uneasy space, one foot in each world, and share what I’ve learned while I struggle to grasp the difference between visiting somewhere, and living there. Jan had already tasted Venice, loved the taste, and wanted an opportunity to get an insider’s view — my view, what I have discovered by living here. She had read many of these scribblings, via Denise, and felt a sympathetic vibration. 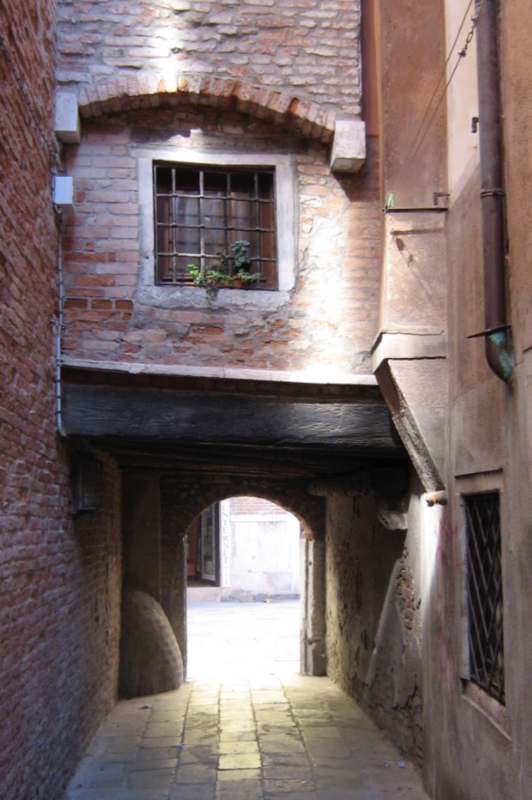 She was tuned like a virtuoso instrument to the peculiar tones of Venice; and as we walked from place to place, the range of her expressions was, for the most part, a narrow one– from joy to exaltation — a narrow range, but an ecstatic one. Glen, on his first trip to Europe, had been first to Rome and Florence. 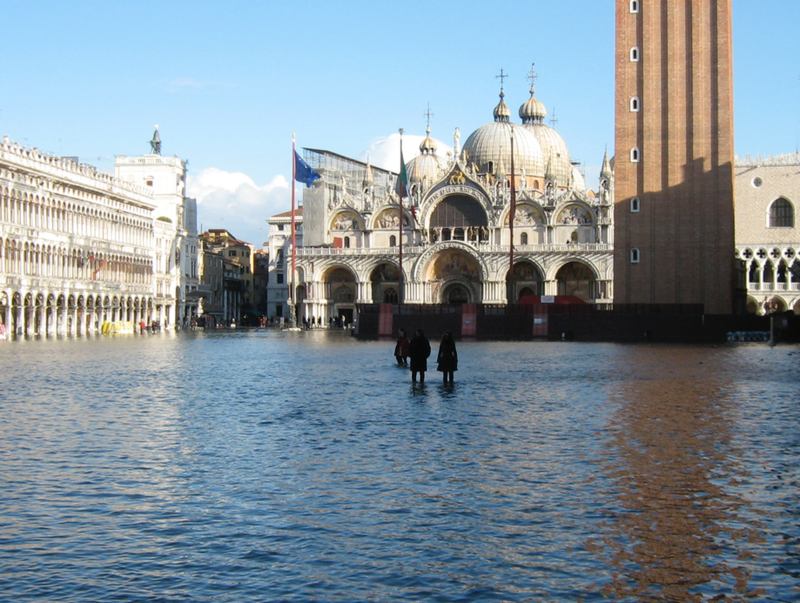 Venice, viewed from that perspective, is a strange proposition; it is so much smaller, so much more idiosyncratic, the important names — except for San Marco — so much less familiar. 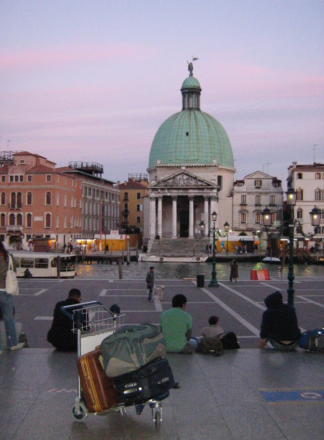 What do most people know of Venice? Piazza San Marco, the Bridge of Sighs, and gondolas. Although leagues ahead of the general day tourist in Venice, when Glen made comparisons — which it was necessary to do simply to process the information — one could tell that after the dazzle and splendor of Rome, and the Florentine concatenation of great names, Venice was a more peculiar proposition, more idiosyncratic, something of a Byzantine puzzle. Looking up at the ceiling of San Giorgio Maggiore or the Frari, he couldn’t help but comment that the white plaster seemed so bare after the technicolor splendor of the Sistine Chapel or Florence’s Duomo. It takes a different sensibility to slip into the space occupied by Venetian renaissance and baroque conventions. A chat about the death of frescoes by wet salt sea air in this island city makes sense intellectually, but it is, after all, more than just about the weather; necessity is the mother both of invention and of aesthetics. Here, where the frescoes were eaten alive by the very air, oil on canvas took their place, and in this medium came the dazzling light and jewelled colors of the Venetian renaissance: Carpaccio, Bellini, Tiziano, Tintoretto, Veronese. The children, on the other hand, Chris and Katie, 13 and 10, with no immediate frame of reference (although they were obviously well-prepared, arrestingly so) and the kind of vague and intense expectations children have, approached the city with that distinct blend of curiosity, openness, of wonder and magic, that is the secret of childhood and which we all need to strive to remember and stay in touch with. Certainly they were bothered by the frequently cold wind, the gusts of rain, the “now let’s go here, now let’s go there” locomotive the adults powered and I led, and certainly not immune to the allure of gelato and model cars — and I knew, from touring Venice with my own son at the age of twelve in 1990, what that was all about — you could sense the moments when they were suddenly dazzled to distraction by — and it differed for each — something specific and concrete that catapulted them outside all of their expectations and into the realm of the sublime. And some of the conversations I had with Chris and Katie provided me with some of my own best momentary insights into what this city, what these buildings and these ancient stones and paintings mean. 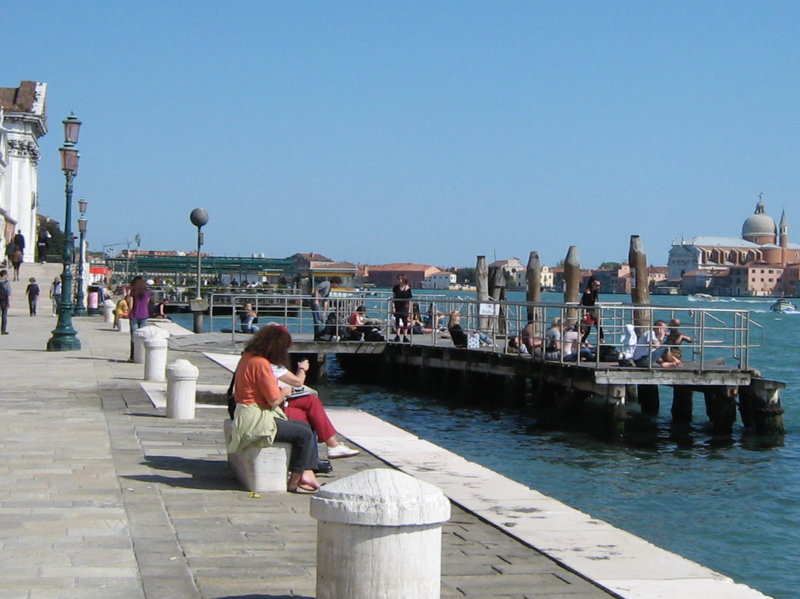 We met at Piazzale Roma, taking the 82 vaporetto around Tronchetto and down the Guidecca Canal, toward San Giorgio Maggiore. I thought a trip to the top of the Campanile there might be a good start for the day. 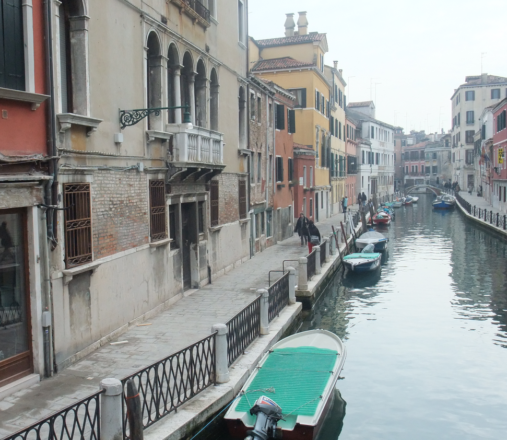 A trip down the Grand Canal can be more dazzling, but Jan and Glen had already done that the night before, and Chris and Katie would certainly be doing it again, so I opted for a more contextual entry to our inevitable starting point. 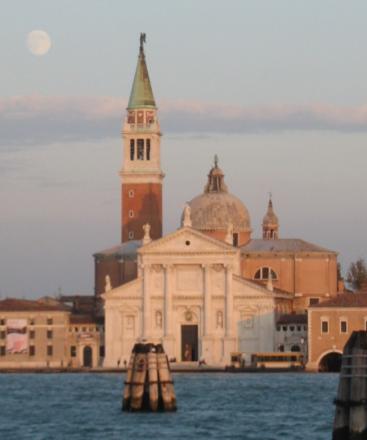 Besides, I prefer San Giorgio’s campanile to its more famous sister in Piazza San Marco. I find the view more complete, with a sense of just how Venice is situated in the lagoon, protected from the Adriatic by Lido and surrounded by clusters of smaller islands, narrow navigable channels, broad sand bars and bricole that mark the way through the shoals and sandbars. Stepping into San Giorgio Maggiore for the first time, thanks to the monumental genius of Palladio, is a humbling experience. The vast space is splendid in the truest sense of the word, with its harmonious vaults, the musical placement of niches and altars, the simple grey and white stone pallette, and then the ravishing marble parquet of the floors. Jan was, quite simply, overwhelmed; Glen, fresh from St. Peter’s in Rome, was finding a personal context for this seemingly vastly unadorned space. The kids, quiet, struggling with how to both respond and behave in this grave and imposing space, took a while to adjust, and then focused on details as kids will– carvings, grotesque and angelic, the marble patterning on the floor, the height of the dome and the incredible carved wood of the choir stalls. “So old,” they murmured– and not for the last time. “It’s all different,” and “it’s all done by hand!! !” — frequent motifs during the day. These simple apprehensions are the keys to slipping into the space where one can appreciate the wonders of the past that still exist in our prefab world. Chris, studying the renaissance in school had it all down before hand — the place of the renaissance in history, its revival of classical forms. 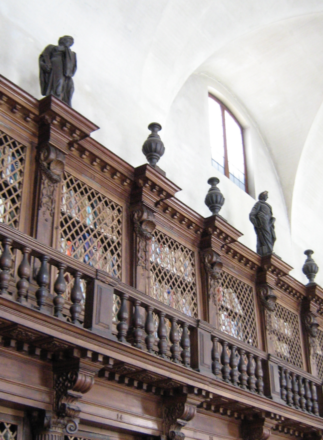 That mastering of ideas — of book-learning, as it were, is one thing. But to touch the stone and get close to the woodwork of the choir stall and see the effect of the light through the clerestory windows on the stone floors and the marble altars and the paintings on the wall, is to experience it, to understand it not only with our sophisticated and educated nervous systems, but with our hearts and our souls, at which children excel. One the way to San Zaccaria I led them through the lobby of the Danieli Hotel. Although it may have equals, there is none better; it’s jaw-droppingly Venetian, this 14th century marble extravaganza, its gilt ceilings hung with flowered Murano glass chandeliers, its marble stairway still waiting for someone out of Proust, the duchesse de Guermantes, perhaps, to descend, draped in Fortuny and carrying a feathered fan. It was great place to warm up. Chris splayed on one of the couches while Jan and Katie examined the tea service and menu, where, for starters, a cocktail is €16. 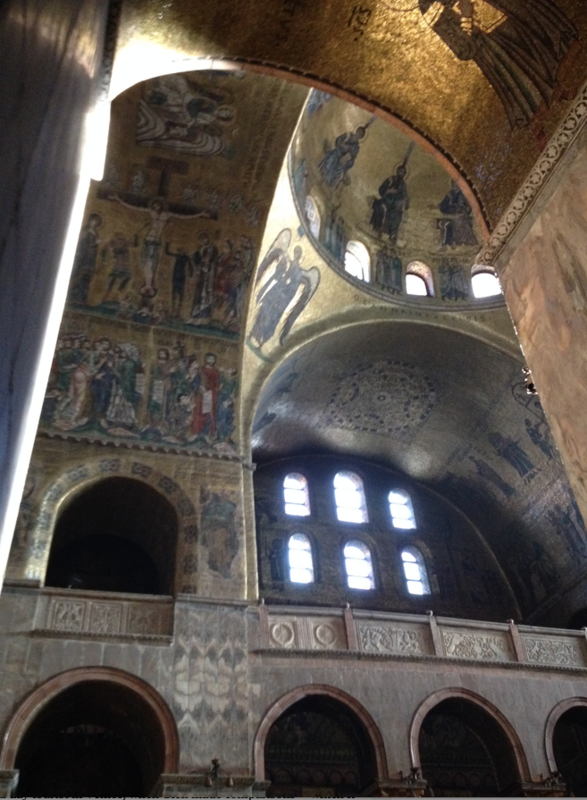 I had hoped that San Zaccaria would be open; the Bellini altarpiece there being one of the finest to be seen anywhere; but it wasn’t open, and so we headed to San Marco from behind. The Piazza was packed solid, and although it was difficult to walk around to the front of the basilica, the line to actually go in was surprisingly short. It never ceases to amaze me how these dense hordes of tourists hit the piazza and stand about, here for some impenetrable reason; they chat, take pictures, look at their feet, at the pigeons, at their friends, at anything but the buildings surrounding them, figuring out where they will go next — McDonald’s or pizza? — or talking on their cellphones or looking at what everyone else is doing. It was just as well they stayed in the piazza while we went inside the basilica. The basilica, of course, overwhelms. For everything I pointed out to Chris and Katie, they pointed out something to me, either in the form of a question or a mere observation. 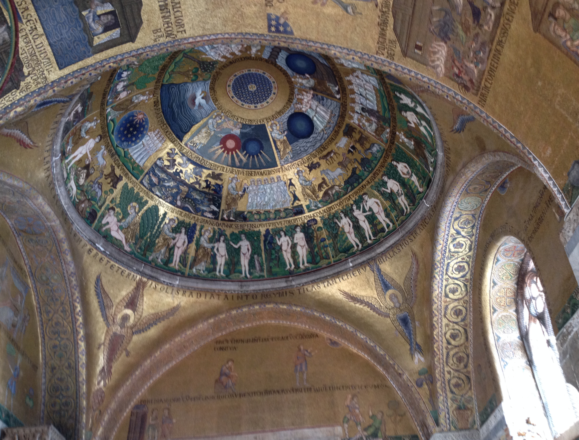 The cavernous space of the basilica dwarfed Chris; the multiple domes amazed him. At any age, that can be a startling realization. We are used to seeing a building go from foundation to roof in a matter of months, a year, two at most. It is hard to grasp that two or more generations of craftsmen might be born, work a lifetime, and die while the building which absorbed their life and their energy was scarcely halfway toward completion. In the museum on the upper level of the basilica, the character of the labor and the intricacy of the work were recurring themes. A small and dwindling cadre of craftsmen remains who alone are capable of restoring these irreplaceable places from the ravages of time, while the notable features of the buildings of our time is their size and particularly their height. 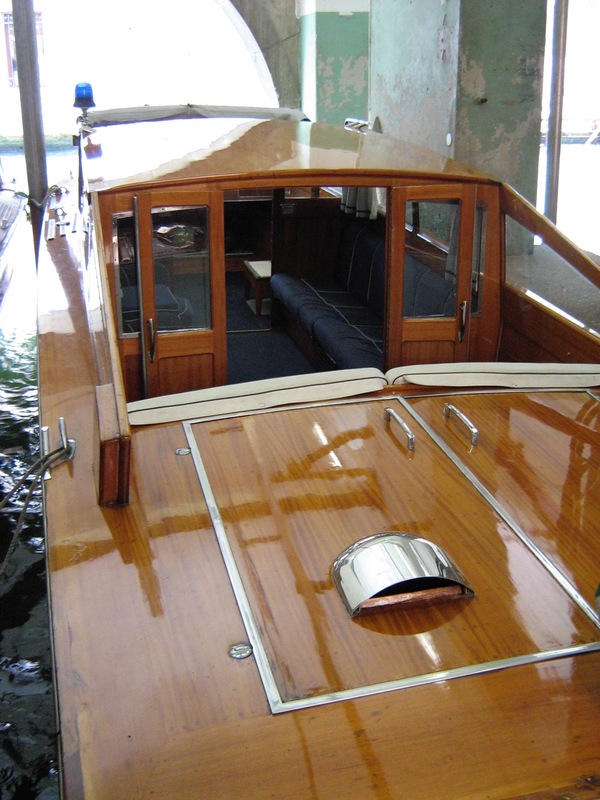 Except in rare instances there is no workmanship on their exteriors and precious little in the interiors. That is part of the childlike wonder we experience stepping into these landmark spaces that have managed to survive. I understood what Katie meant when, standing on the balcony of the basilica, facing the Doge’s Palace, Katie said, “It’s still here. Nothing bad happened. That’s so great.” There was both wonder and trepidation in her voice. She was five when the World Trade Towers collapsed under attack. She meant exactly what she said. Later, after lunch, we popped into Tonolo, the bakery with, I believe, the best pastries in Venice. 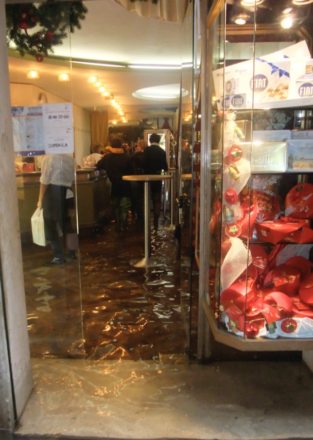 In the mornings and early afternoon, it is usually mobbed; people three deep along the glass display cases and deeper back by the counter where coffee is served. We had eaten a late lunch and by the time we got to Tonolo it was nearly empty which is a mixed blessing, wonderful becase there is plenty of room, but often at those times the pastries are depleted. The windows near the door were fairly empty; some of my favorites, such as the pistachio cake with thin marzipan frosting, were gone; but we had coffee cream puffs and cappucinos which never fail to rev up the spirit in the waning hours of a long day. Nicolas Regnier’s “Baptism of Christ,” Church of San Salvador, Venice. 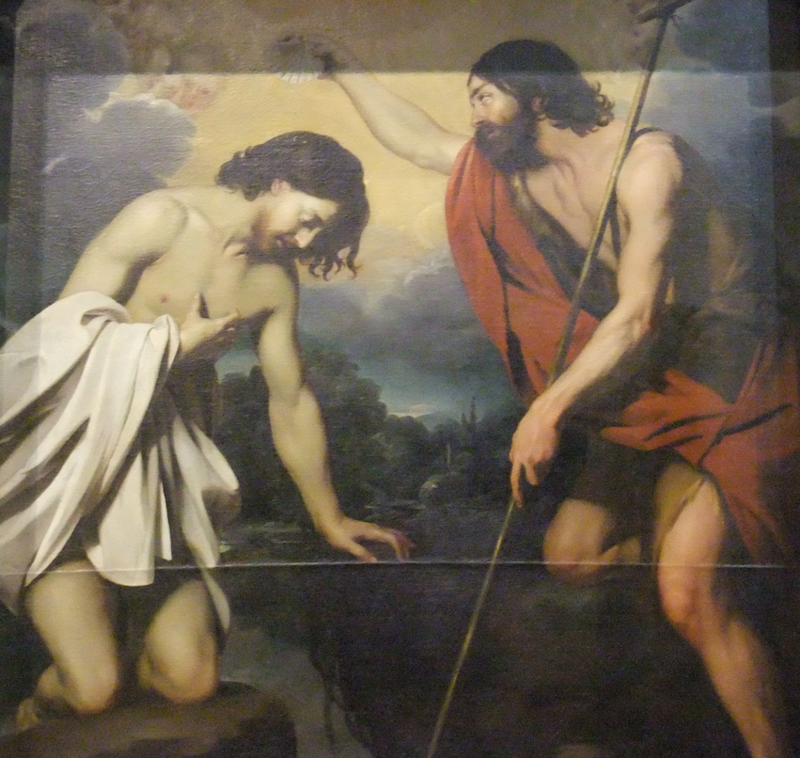 Baptism of Christ by Nicolas Regnier (1591-1667) in the Church of San Salvador, Venice. Regnier was a Flemish painter, a contemporary of Caravaggio, who moved to Venice in 1626, age 35, and stayed until he died in 1667, age 76. 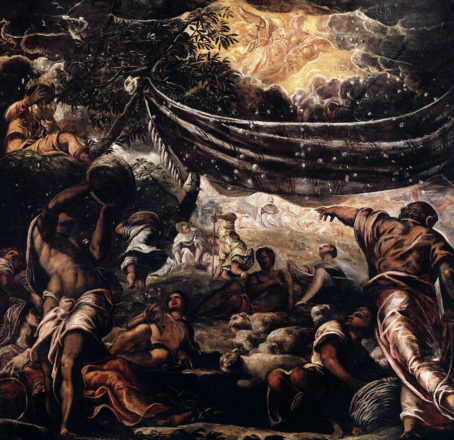 His Baptism of Christ hangs in a corner of the Church of San Salvador on Campo San Salvador a hundred meters or so from the Rialto Bridge. I visit this painting whenever I am in Venice. Pride of place at San Salvador goes to an extraordinary Titian Annunciation. 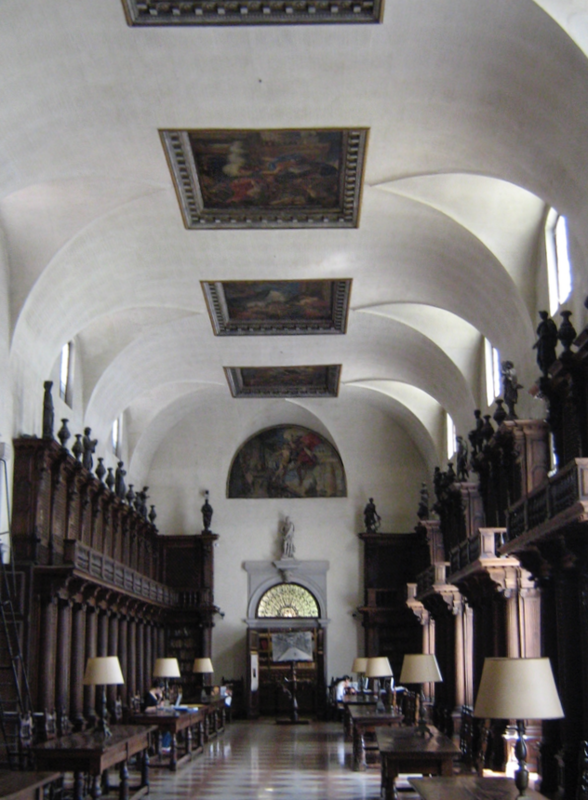 Regnier’s painting is off in the left transept, inconspicuous. That is fitting. It is a humble painting. I searched for a better image online and could find none. I snapped this not-quite-satisfactory photo on the fly in 2014 to remind myself of its beauty. 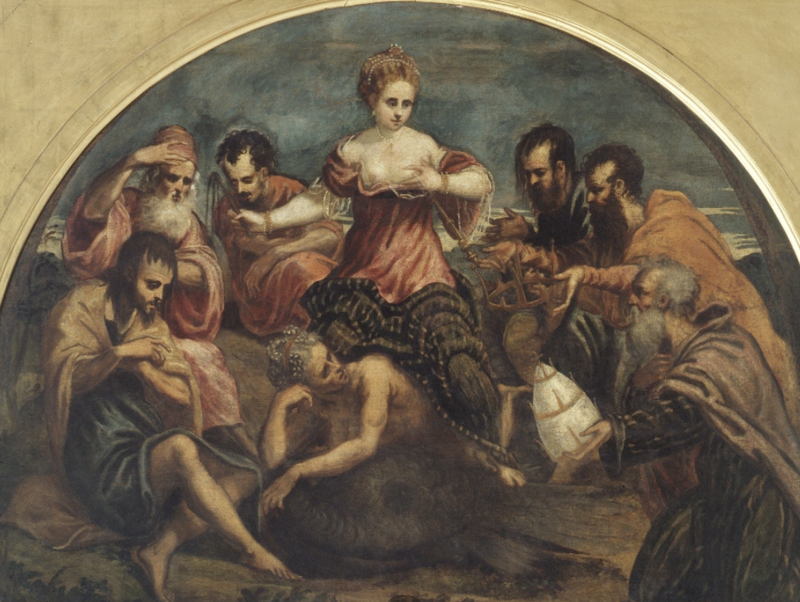 I visit this painting whenever I am in Venice. What I love so much about it has nothing to do with religion. It is the exquisite dialectic of masculinity and femininity between the two figures. Christ kneels in abject humility, simple and touching. 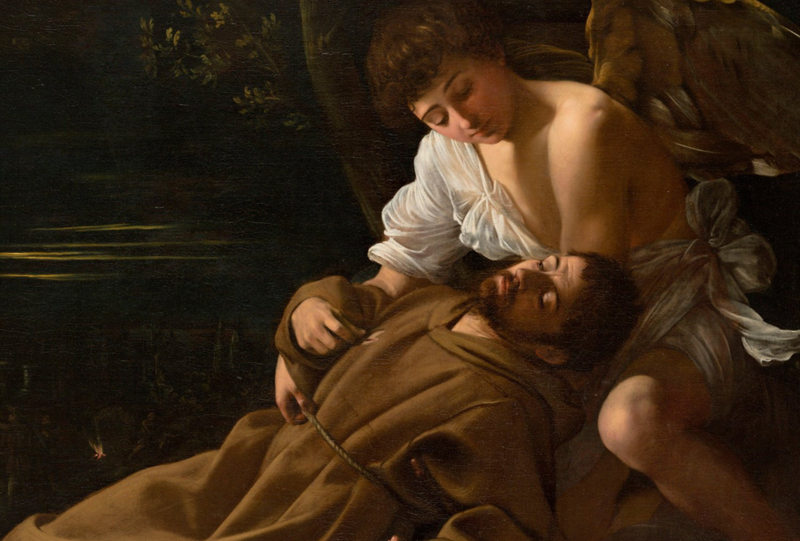 I can’t think of another rendering of Christ that is both so boyishly innocent and sensuous. John the Baptist’s love is weighted with the sorrow of mortality. 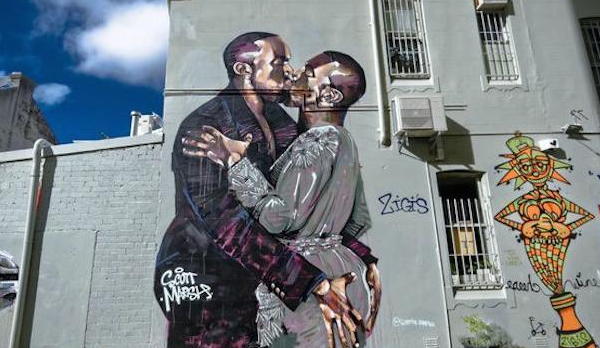 Their arms unite them in a cosmic triangular embrace. The radiance of love suffuses them, seemingly sourced from the shell in John the Baptist’s hand, from which flows endless grace. 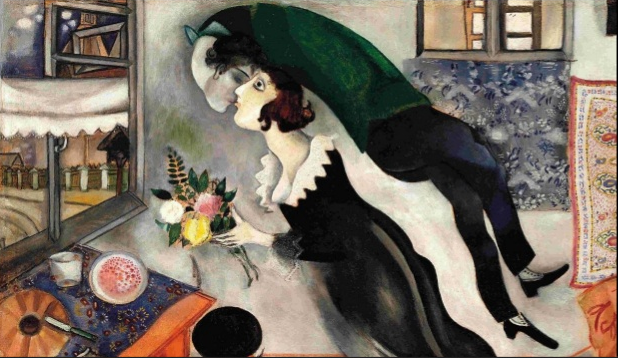 This painting always moves me profoundly, where many more famous and highly regarded works don’t move me at all. 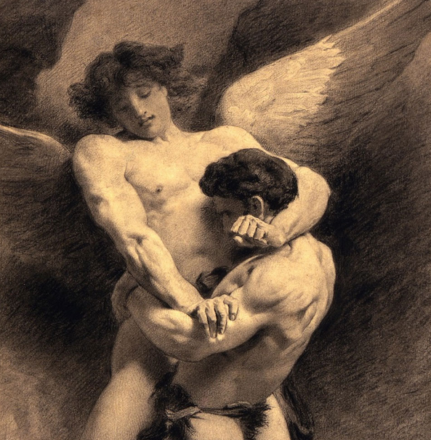 One could quibble about the quality of the brushwork, I suppose, but there is no quibbling with its transcendent vision of human and suprahuman love, expressed through the tenderness and adoration obviously and palpably flowing between these two young men. it often weighs too heavily to bear. know what it is. Where is the answer to our prayer? come lift us from the muck to radiant air. us beauty, hope, joy, a reason to live.